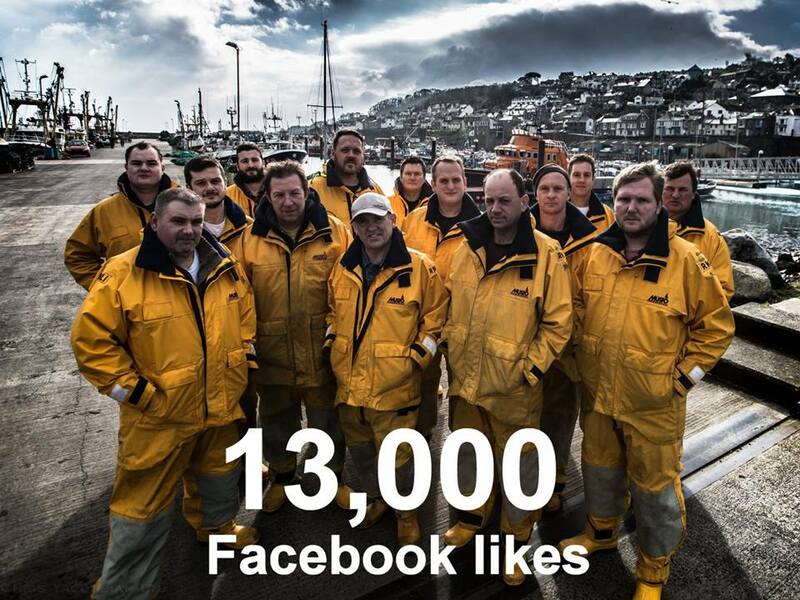 Penlee lifeboat facebook page hits 13,000 likes! 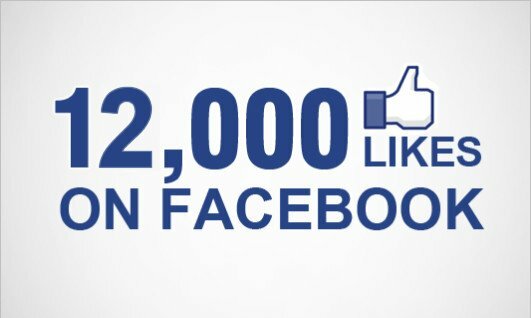 Penlee lifeboat facebook page hits 12,000 likes! 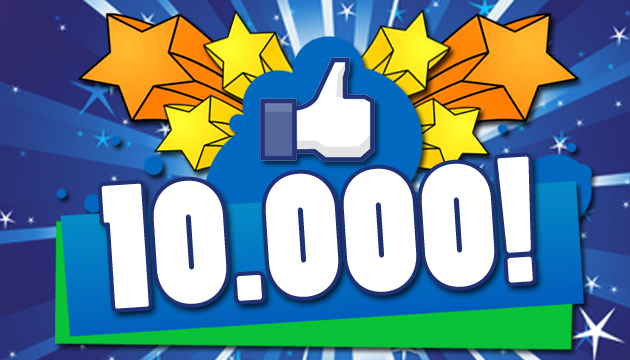 Penlee lifeboat facebook page hits 10,000 likes! Young lads give up a full day of their half term holiday to sell bags of sweets . An amazing £1,230 raised for our appeal. Penlee says goodbye to a dear friend and colleague, Frank Wallis. 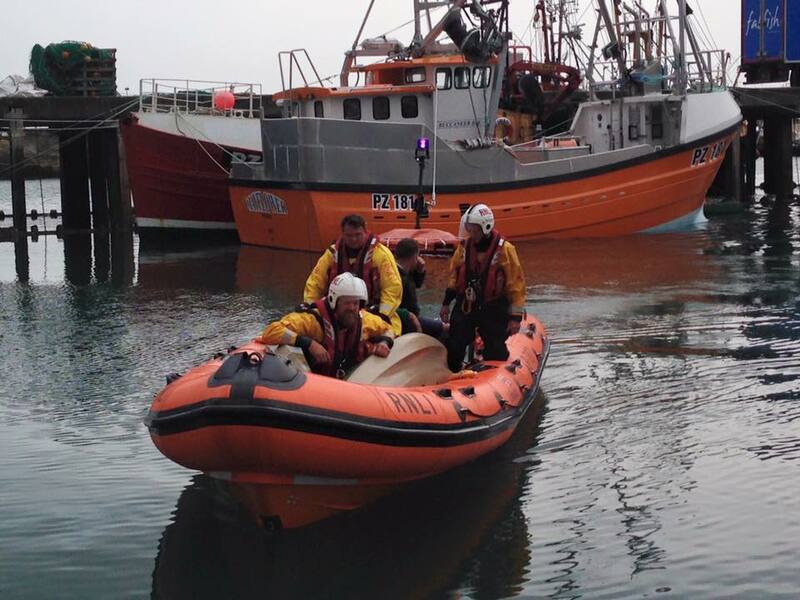 2 Persons rescued by Penlee ILB send thanks to the crew on Facebook. 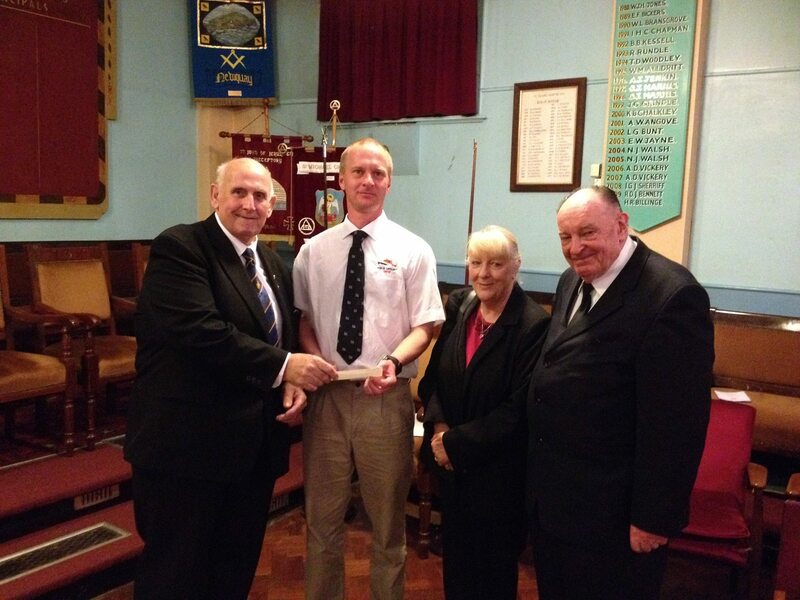 Penlee Coxswain and Mechanic attend a cheque presentation. 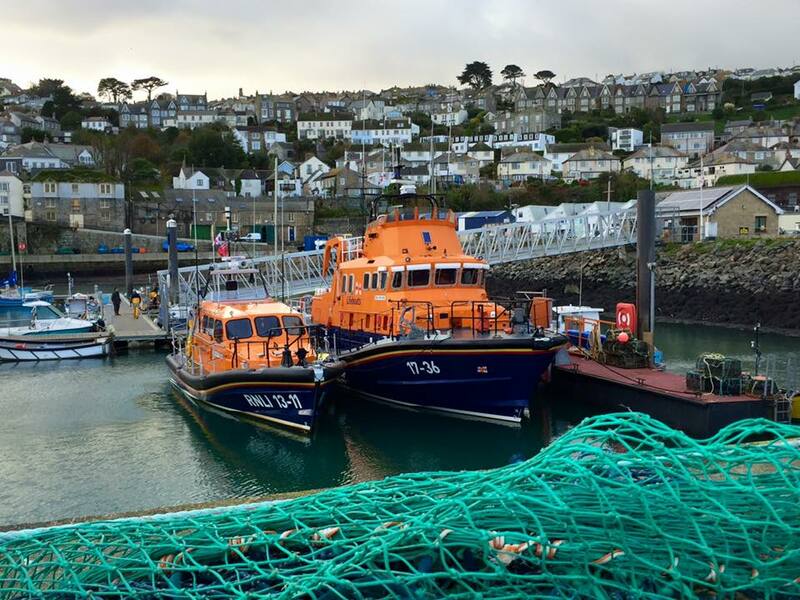 Retired Penlee lifeboat 'The Brothers' has new role as a 'Dive support vessel'. GEMS Bolitho School "Coast to Coast walk"
Penlee wins £300 in the YBSCF local bid. 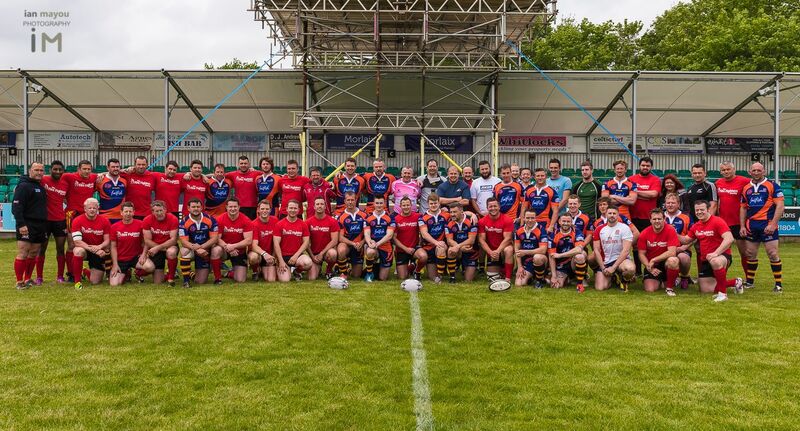 RNLI 32 points - Cornwall Fire Service 22 points. 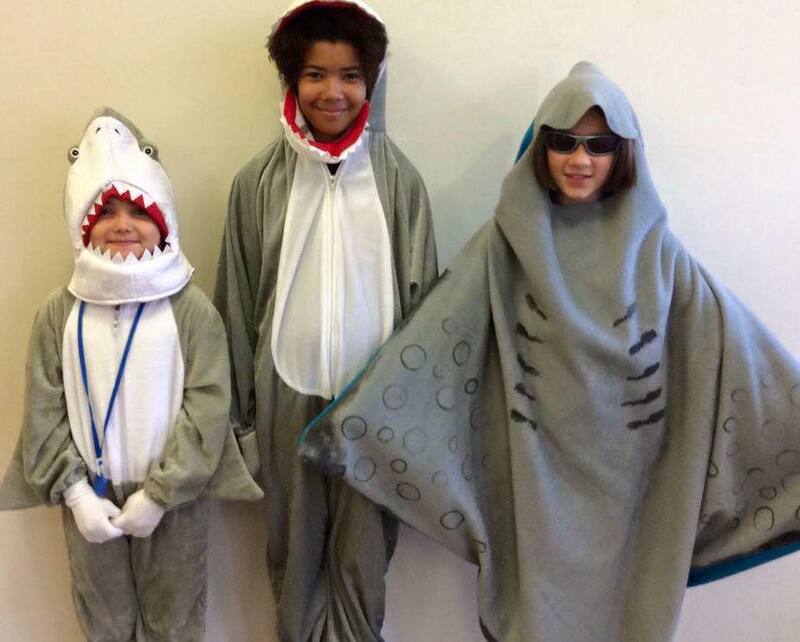 See how Mounts Bay Academy came up with a novel way to raise money! Today (30th December) we remember the tragic death of former crew member, Jimmy Hocking Pentreath, who was swept off the slipway at Penlee on 30th December, 1961. Jimmy aged 78 years, a Mousehole man, had a life-long association with the Penlee lifeboat and he died doing a job that he loved. 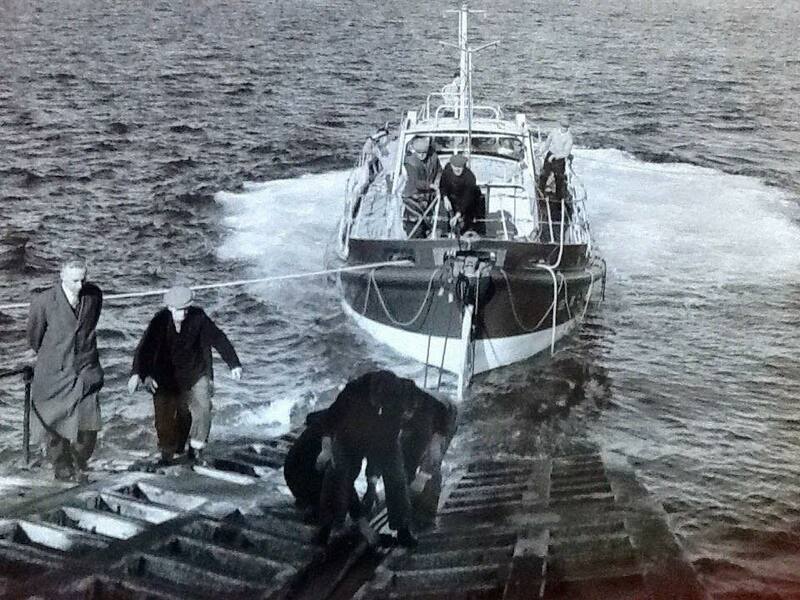 The lifeboat crew had just completed another service to bring a sick seaman ashore from the British Shell tanker, 'Varicella' - the job of putting the Solomon Browne lifeboat back in the boathouse was going smoothly until a sudden swell caused her to veer sideways. 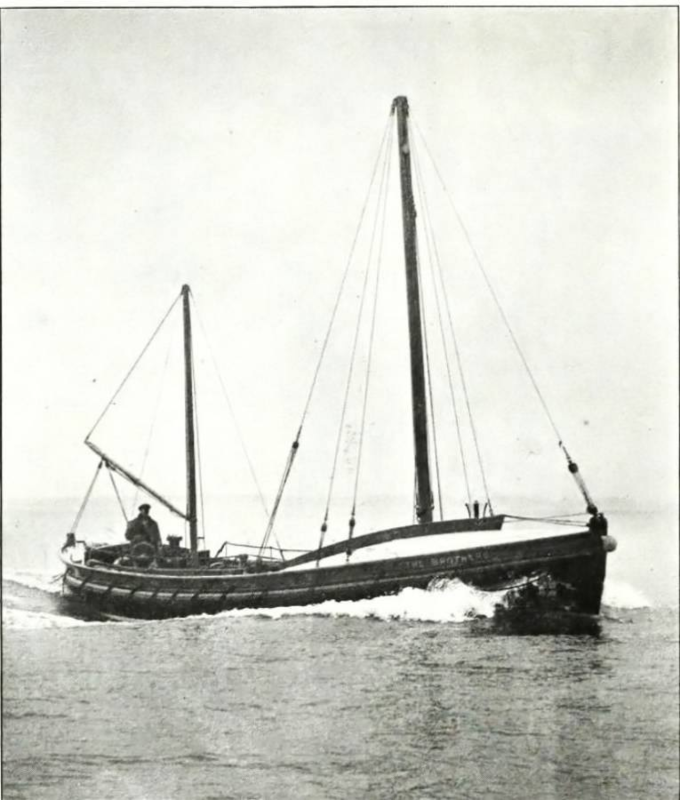 Jimmy Pentreath, who was then part of the shore-crew, was caught by the wire hawser, knocked off the slip into the sea, and was killed instantly. Another member of the shore-crew, Bob Blewett, aged 70 years, was also swept into the sea. He was brought out unconscious with serious injuries but later recovered. 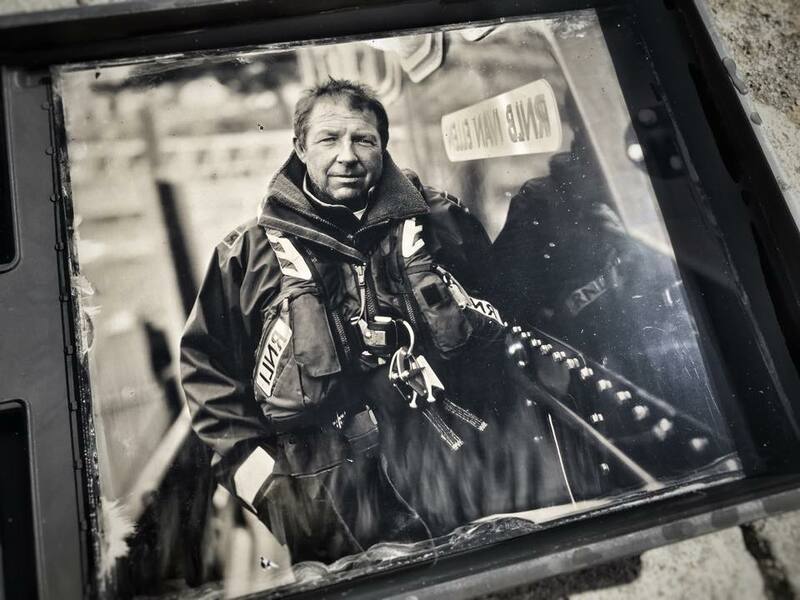 Jimmy's name is etched into the RNLI memorial at Poole - gone but never forgotten. Again it's all down to you, sharing our messages and enhancing them by adding your own comments - long may it continue! 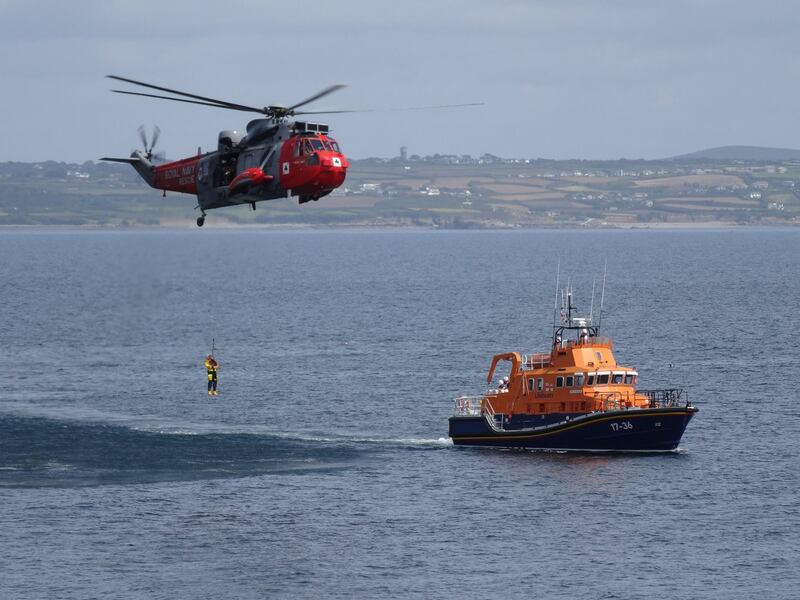 On Tuesday 29th December 2015 the Lizard, Falmouth and Penlee All-weather lifeboats will be taking part in a joint exercise with a search & rescue helicopter from RNAS Culdrose 771 squadron. The exercise is scheduled for 11am off the Lizard station in Kilcobben Cove. This is expected to be the last exercise for the lifeboats and helicopter and possibly the last time they will operate with 771. Sadly 771 step down from search & rescue work on 01-01-16. The exercise is dependent on both the weather and operational commitments. If the exercise has to be cancelled the stations will post on social media at 9:30am on 29-12-15. At 6:06pm on 18th December 2015, the volunteer crew of the 'Ivan Ellen' lifeboat were placed on immediate readiness to launch to the aid of the container ship 'Samskip Express' which had suffered engine failure off Mullion. 10 Penlee crewmen responded to the pager alert and remained on station until the Dutch Tug 'MTS Viscount' was alongside the casualty vessel. 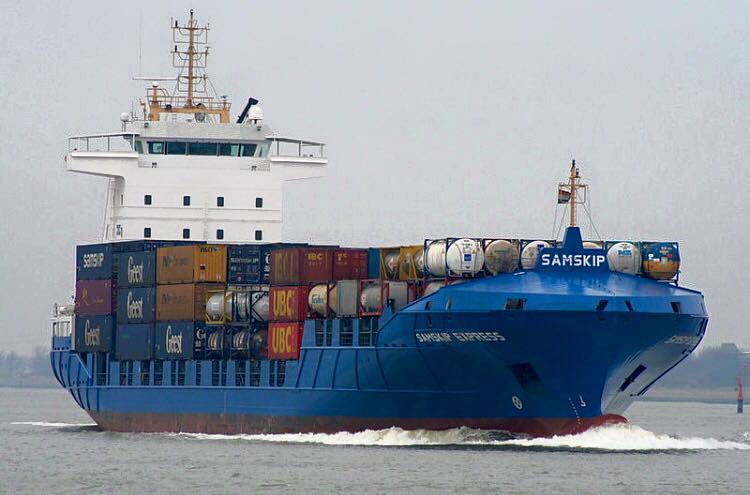 With the 'Samskip Express' safely under tow the Penlee lifeboat was stood-down. 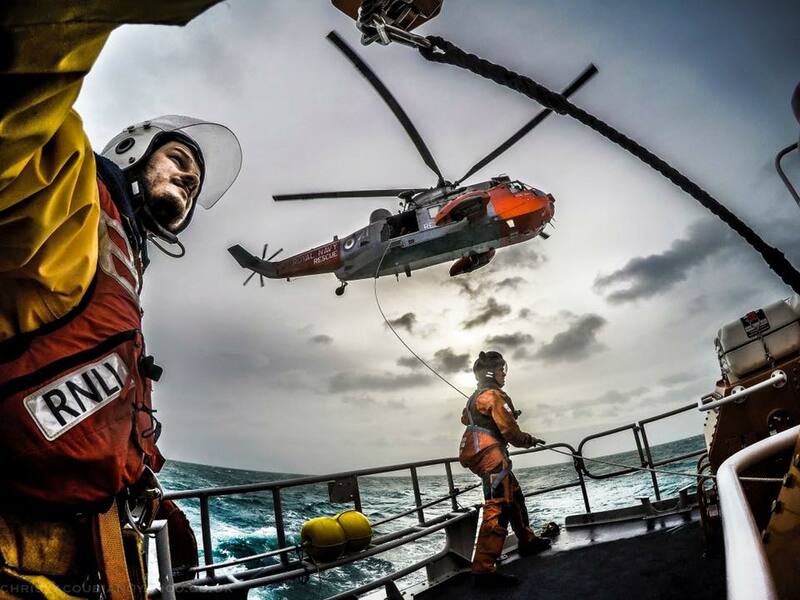 Amy Smith Photography have had a few calendars made with a selection of her favourite Sea King and Lifeboat photos from this year. These are very limited edition. A nod to 771 squadron who are set to cease SAR operations at the end of the month and also to the RNLI, because Amy loves Lifeboats. The Calendars are A4 in size and cost £12 plus any postage. 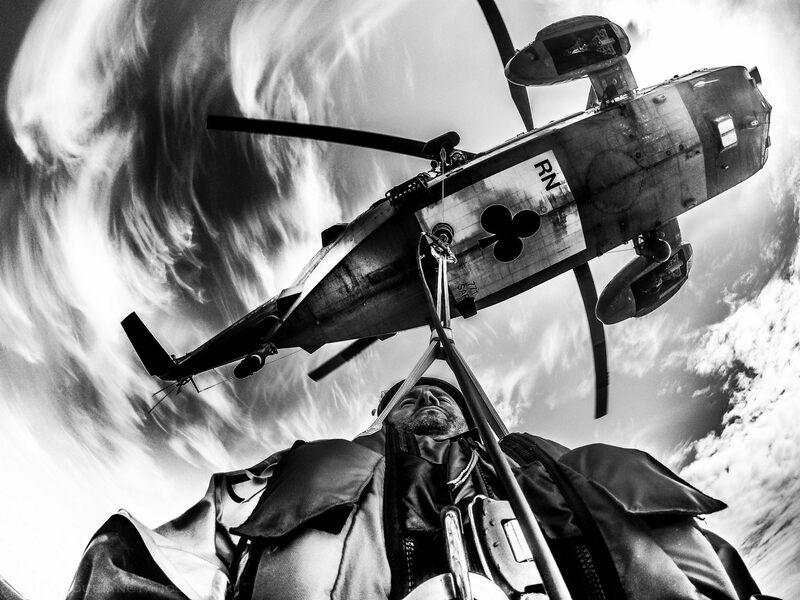 £5 (that's 100% of the profit) from each calendar will go to the Penlee Lifeboat Station Appeal. Just get in touch with Amy if you'd like one via the FB message and we can sort out postage or a meet if your local. Amy is not a stranger to Penlee, during the fish festival Amy strolled up to the station and gave us some of her wonderful photos to sell/auction for our appeal. 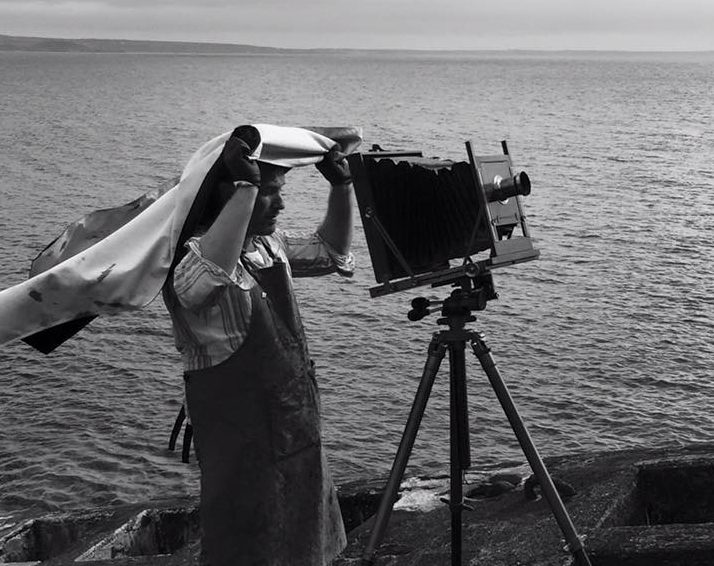 Amy is a keen and talented photographer who loves all things connected with the sea and Cornwall. I would like to bring our fund raising year to an end with a few words of thanks to everyone who has helped us to raise over £10,000 in 2015. Thanks firstly go to our small but dedicated committee who worked so hard to produce what many people have told us was a very different and brilliant lifeboat day this year. We could not have done that without the help and support of our friends and volunteers both here in Porthleven and from Penlee Lifeboat Station who also worked hard on the day to make it all happen, thank you one and all. We are most grateful too, to all the Porthleven businesses who so willingly support our branch's fund raising and who contribute so generously to all the events we organize. 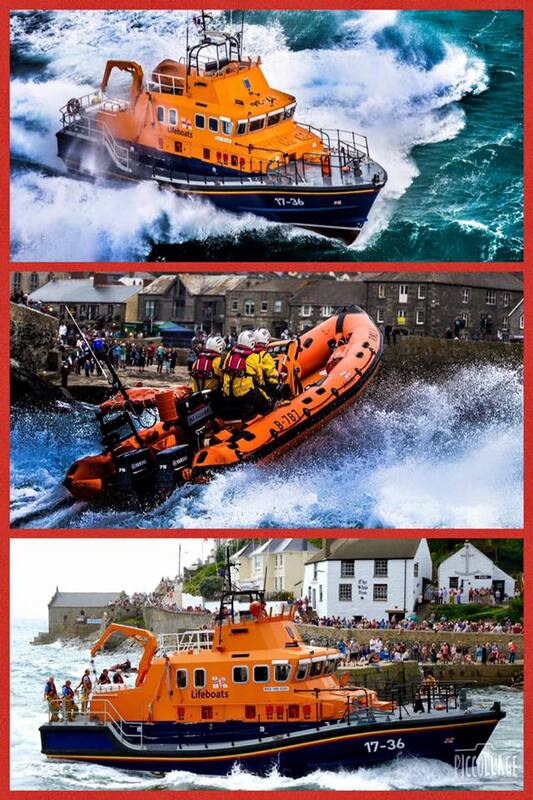 Our work will continue in 2016 starting with a fun Race Night in the Atlantic Inn, Porthleven on Saturday 16th January, after which we shall start organizing lifeboat day 2016 which will be held on Sunday 14th August. 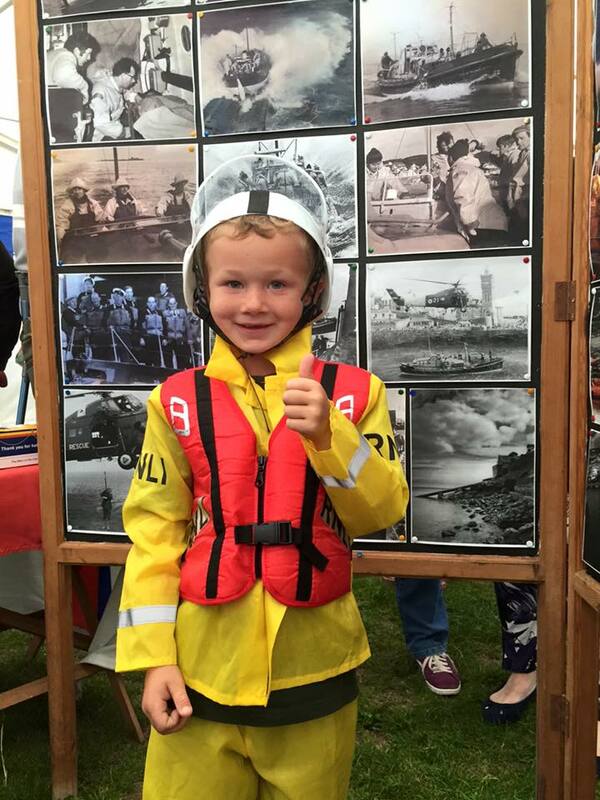 We have lots of great ideas to make lifeboat day 2016 even better than this year's event and we look forward to seeing you all there. So thank you all once again for all your help and support during 2015. We can not do what we do for the RNLI without your help and support and we hope and trust that we may call upon your generosity again during 2016. Check out the latest issue of 'Cornwall Today'. 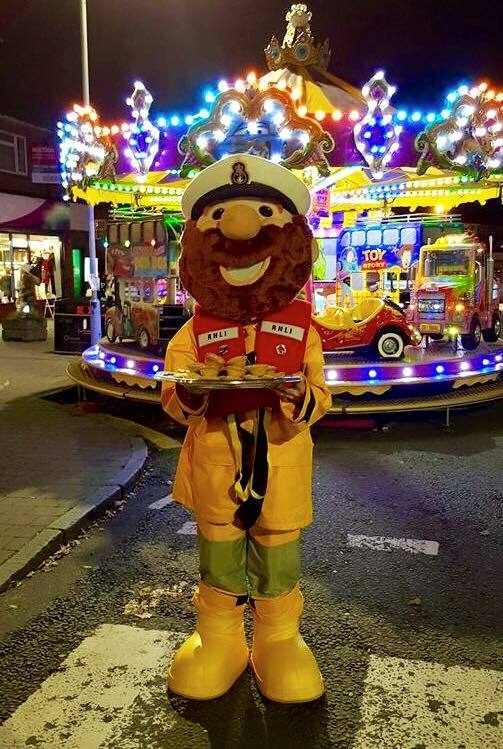 Stormy Stan had a busy Saturday night handing out mince pies at Chalfont St Peters Christmas Fair. In total he collected £175.50 towards the Penlee Lifeboat Station Appeal. 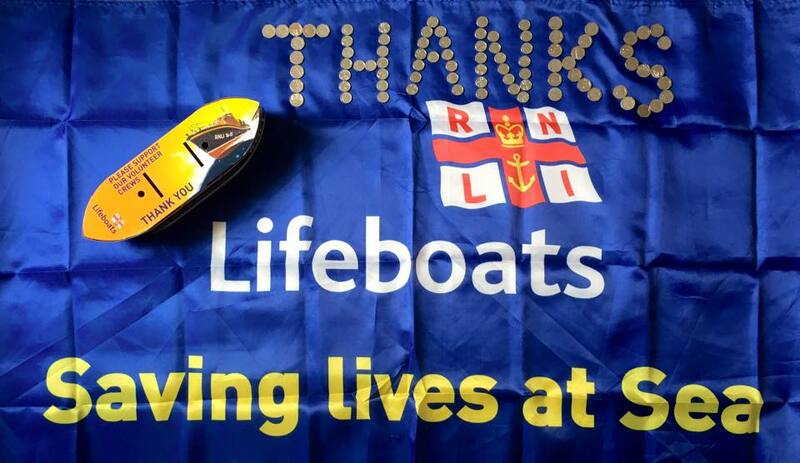 Well done and thank you Chalfont RNLI Branch! 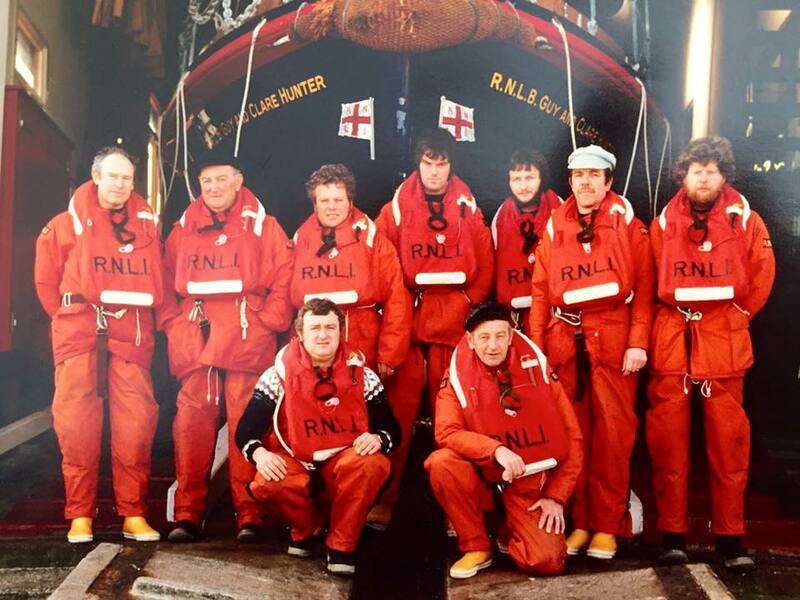 It is with sadness that we share the news that two of our former crew members, Brian Cary & Mike 'Butts' Buttery, both from Mousehole, have recently passed away. Brian spent some time as 2nd Coxswain and reserve crew on the Solomon Browne Lifeboat, whilst Mike Buttery was part of the reserve crew for a short time in the late 60's, early 70's. They will both be sadly missed by all who knew and loved them. Another two characters gone from Mousehole. Penlee lifeboat's volunteer crew joined Rescue 193 from 771 Naval Air Squadron this weekend in what was the helicopter's last training session in Mounts Bay. The exercise, which began at 10am on Sunday morning, saw crews practice winching in winds of 35-40mph. 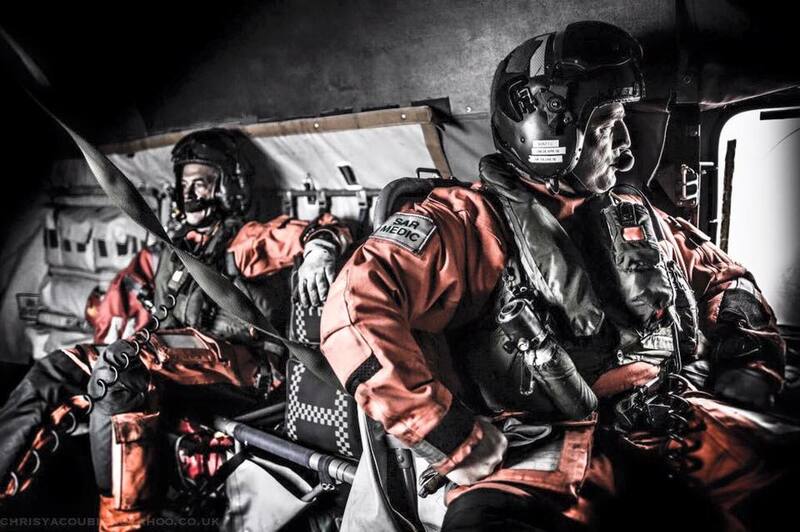 Penlee's coxswain Patch Harvey said: "This was the last training session with Rescue 193 in Mounts Bay. They've been outstanding for us; we work with them, we train with them and it will be sad to see them go. It was a little bit emotional, we've always had a close working relationship with them, and they've always been keen to work with us." 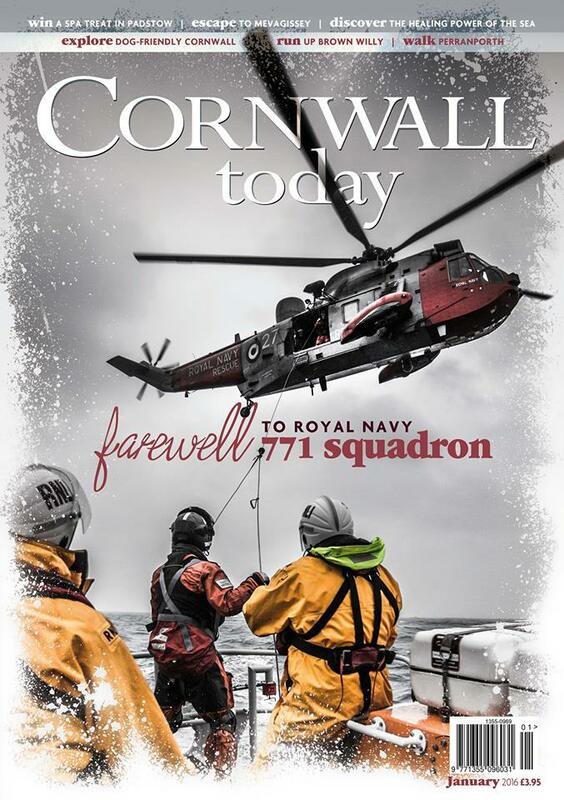 The Sea Kings of Squadron 771 are due to be replaced after 41 years of saving lives from their base at RNAS Culdrose, and will undertake their final search and rescue mission on December 31st 2015. 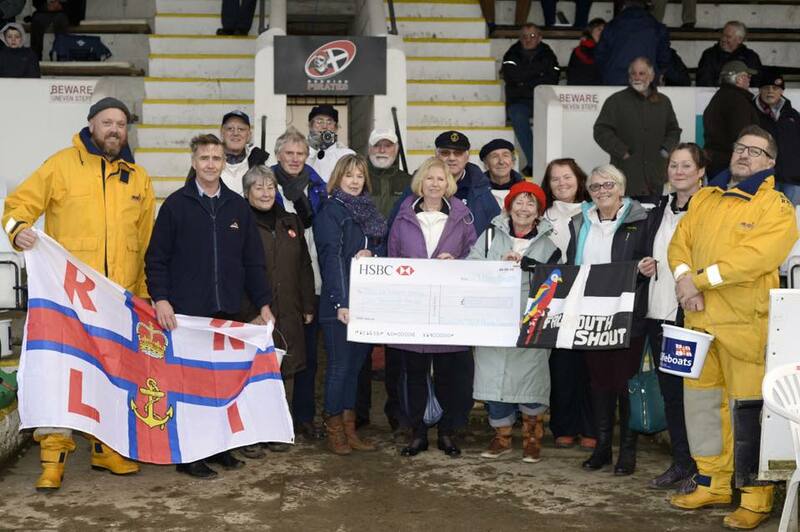 During half-time period at the Cornish Pirates game on Sunday 29th November 2015, Alan Barnes and fellow members of the Falmouth ‘Shout’ Shanty Singers, presented a cheque for £1,000 to our Appeal. 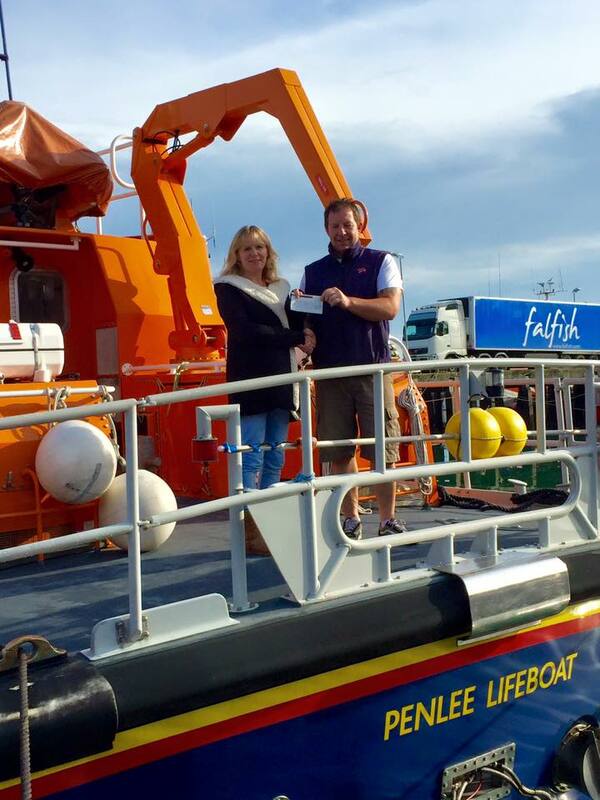 Alan was coxswain of Falmouth’s lifeboat for 15 years, and the cheque was received by RNLI Penlee representatives including long-serving Branch stalwarts Janet Madron and Eric Taylor. Our volunteers also collected from the supporters at the match, against Bedford Blues, raising £563.60 towards our new lifeboat station. A fantastic amount to raise, many thanks to the 'Shout' singers and the 'Cornish Pirates' for their support. 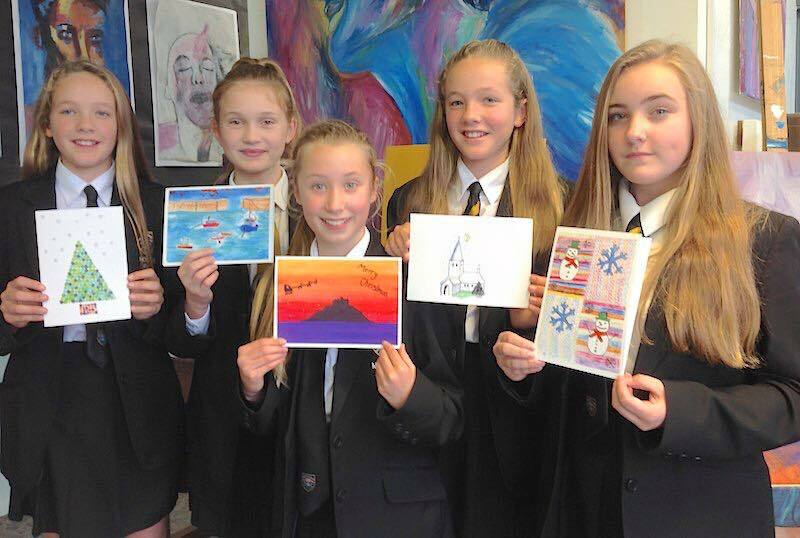 Many thanks to the students at Mounts Bay School who designed these lovely Christmas cards. They go on sale from 27th November at Mounts Bay Academy - £1.50 for 5 designs. Proceeds go to the RNLI. 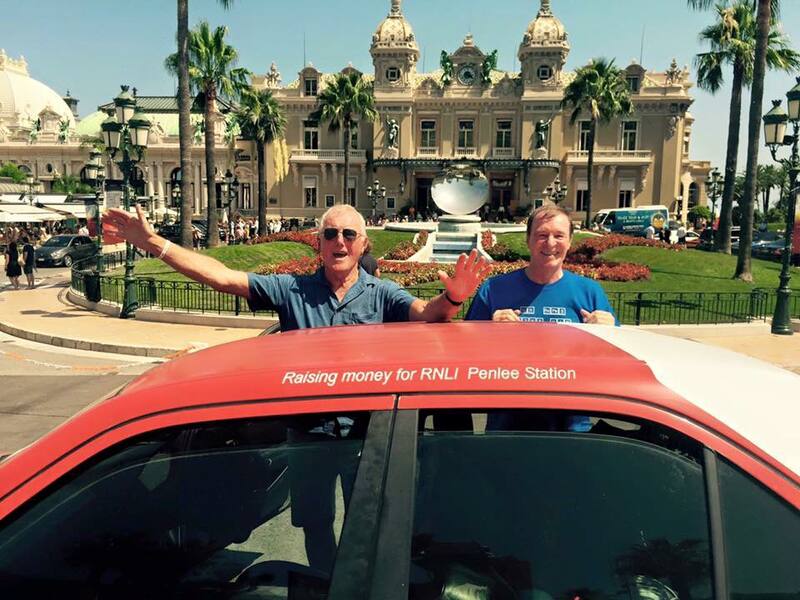 Earlier this year two intrepid travellers on the wrong side of 70, their words not ours, embarked on an epic 2,172 mile round trip when they drove a £300 Mercedes from Chester, England to Monte Carlo, Monaco, raising money for the Penlee Lifeboat Station appeal. David Greenhaugh, brother of the late 'Solomon Browne' crew member, Charles Greenhaugh, and his close friend, Michael Levens, enjoyed every moment of their journey and to date have raised £3,000 for our fundraising pot - the money continues to trickle in! We were thrilled to welcome David to Newlyn this morning for a tour of the 'Ivan Ellen' and a brew with the crew. Young and old had a fantastic morning at the Godolpin Arms Marazion on Sat 21st November. 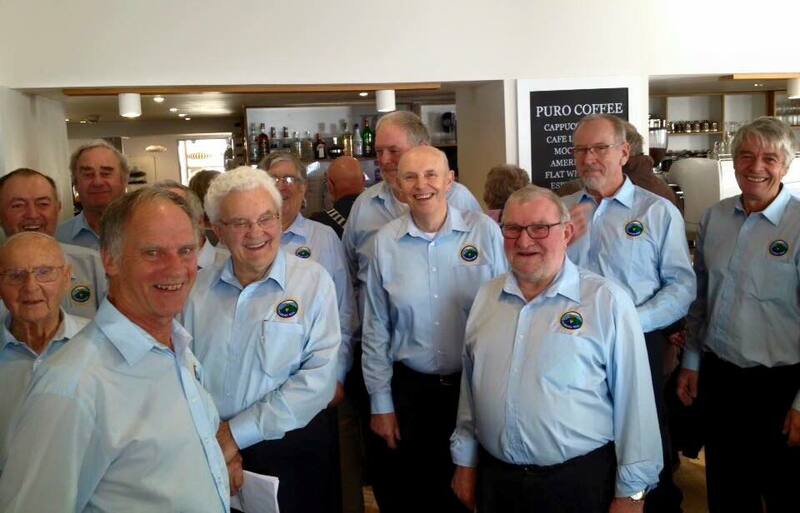 The Marazion Choir entertained the supporters with some great Cornish songs, tea/coffee and cake was in abundance. To complete the morning a spectacular auction of donated items was held, with items ranging from paintings, beer packs, meals in local establishments, a complete DIY breakfast kit and a couple of lovely 'Real Cornish Crab' hampers. The amount raised was a spectacular £1343. Many thanks those who attended, bought raffles, donated prizes, the staff and management of the Godolphin Arms and the Penlee fundraising team. Our reach (The number of people that potentially have seen the post) hit a massive 50,000 - imagine if they all liked our page! 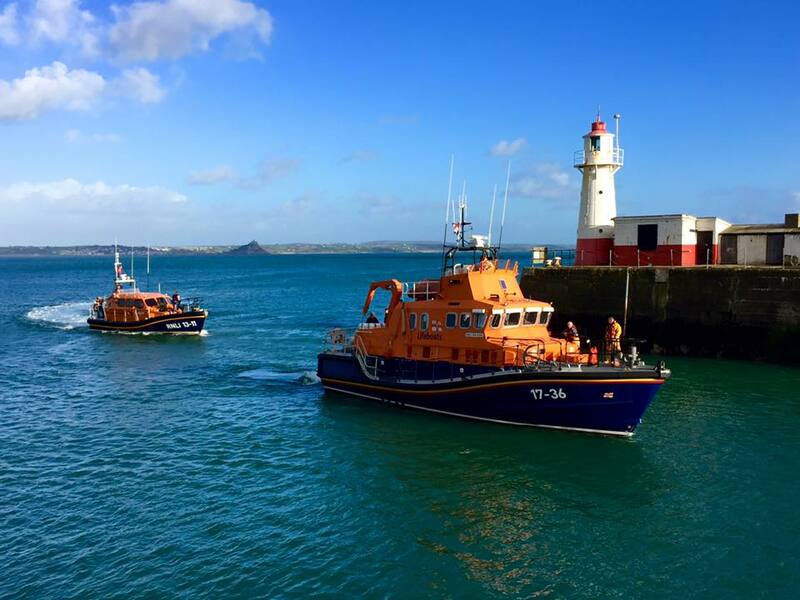 In the afternoon of 13th November 2015, we had the pleasure of escorting & welcoming our colleagues from St Ives and their new Shannon Lifeboat 'Nora Stachura' through the gaps and into Newlyn Harbour. If you would like to see the 'Nora Stachura' then St Ives is the place to be tomorrow! 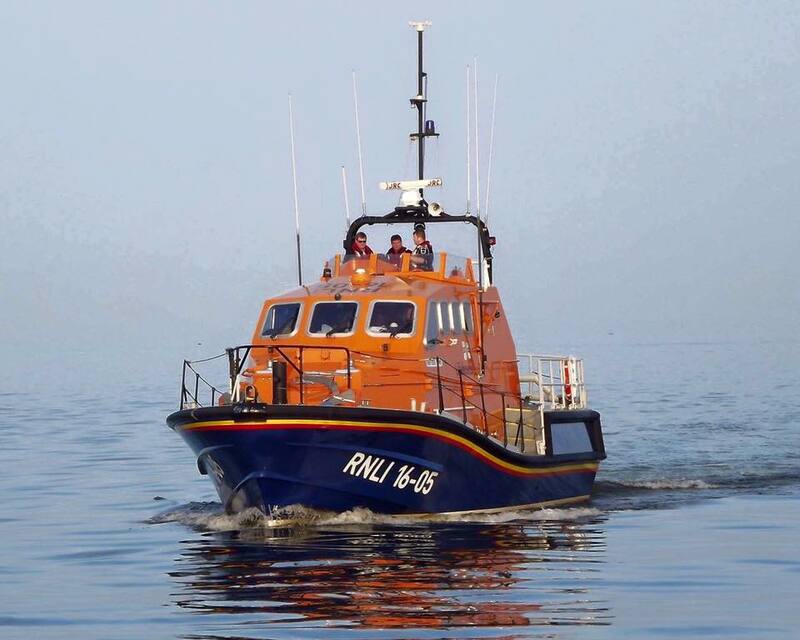 Volunteer lifeboat crew members, led by coxswain Rob Cocking, will bring the Shannon class lifeboat to St Ives at 12pm on Saturday November 14th. 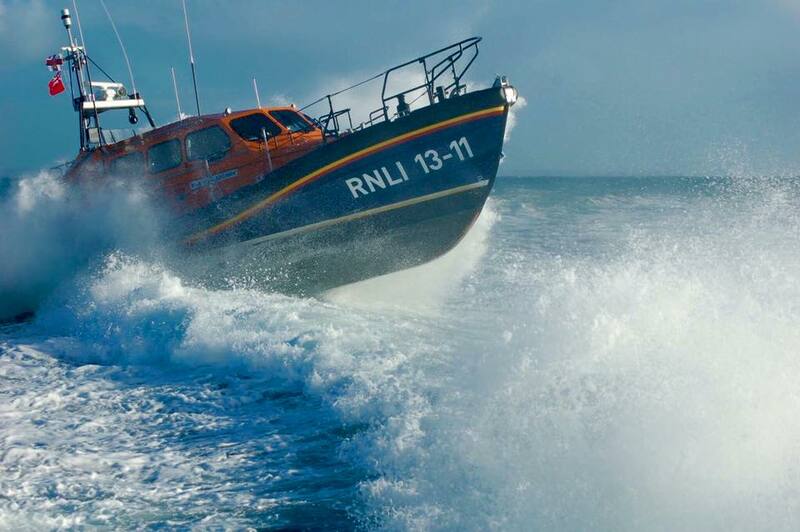 The St Ives RNLI's current all-weather lifeboat, the Mersey class 'Princess Royal', and the D-class inshore lifeboat 'Colin Bramley Parker', will be launching at 11:30am in order to meet the Shannon and lead the new lifeboat into the harbour. 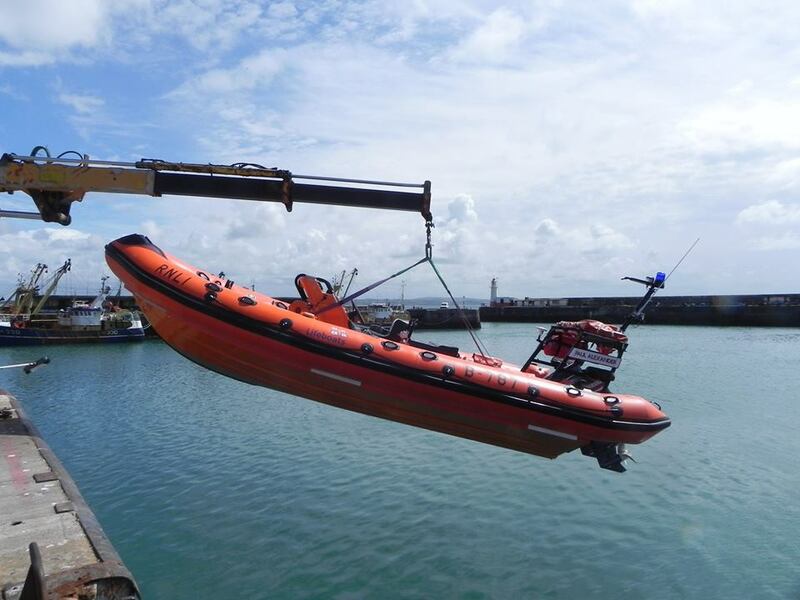 The crew of Nora Stachura will demonstrate the new lifeboat capabilities just outside the harbour, including its manoeuvrability and the new launch and recovery system. 11.30am - The Mersey and D-class lifeboats will launch. 12.00pm - The Shannon arrives outside the harbour, led by St Ives RNLI lifeboats. 1.30pm - The Shannon will be recovered. 2.00pm - The Shannon will be on the slipway for a wash down. 2.45pm - The Shannon will be moved into the boathouse for the first time. 3.00pm - The boathouse opens to the public. 5.30pm - Boathouse will close. Times are subject to change with operational needs. 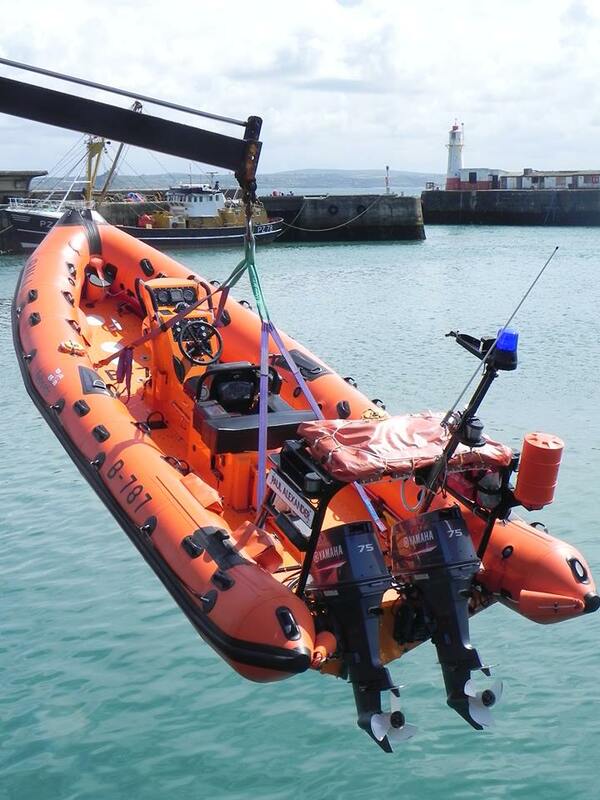 Please go along and help to welcome the 'Nora Stachura' to her new station at St Ives. 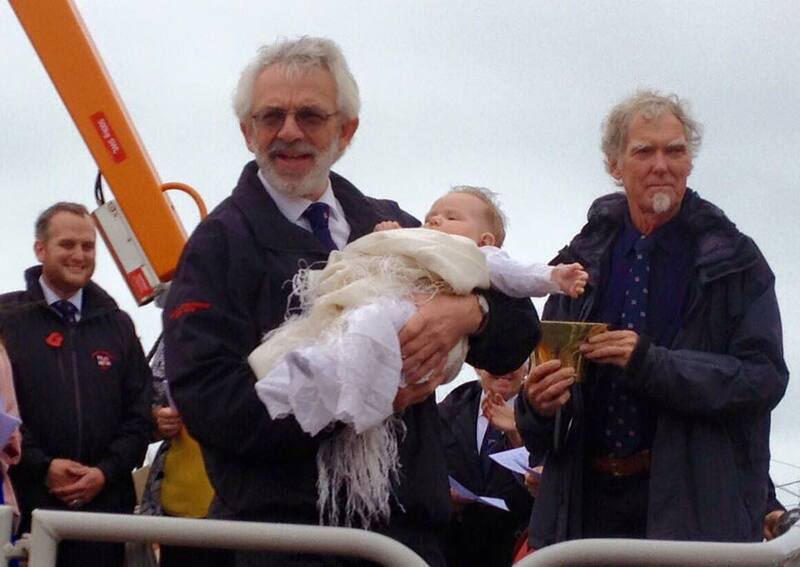 On Sunday 8th November 2015 our lifeboat Chaplain, the Reverend Julyan Drew, had the pleasure of christening Laurel Jaime Kent onboard the Ivan Ellen lifeboat in Newlyn Harbour. The Lifeboat's bell was used as a font with water collected from the sea at various places all over West Cornwall. Laurel is the newest addition to the Kent family, her Daddy is volunteer crew member, Sam Kent, and her Grandad is our Deputy Launching Authority, Graham Henderson. Graham was also deputy 2nd coxswain on the Mabel Alice lifeboat. Welcome to the world of lifeboats little Laurel! 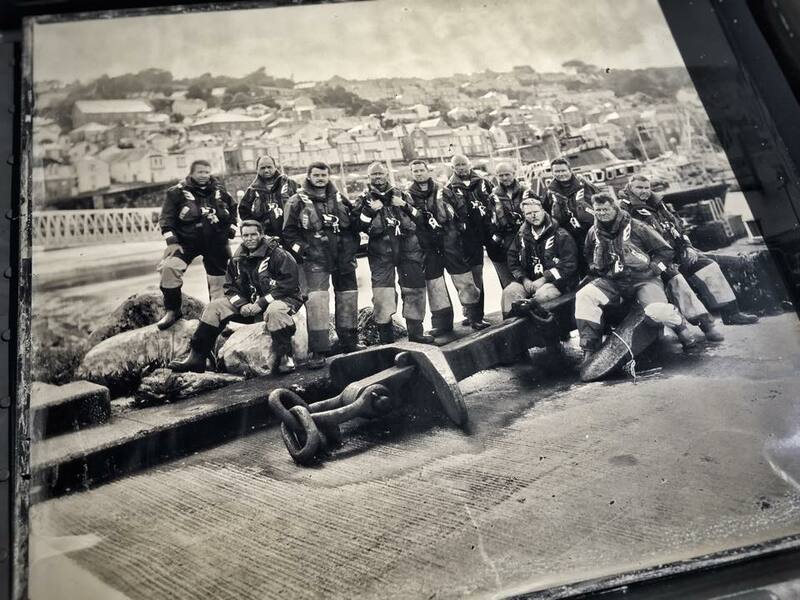 On Sat 7th November 2015, whilst on passage to Poole, Coxswain Kevin Kirkpatrick and the volunteer crew of the RNLI Longhope Lifeboat 'Helen Corrie' ON 16-05 visited the old Lifeboat Station at Penlee Point, Mousehole, to lay flowers and pay their respects to the crew of the Solomon Browne lifeboat. There is a natural affinity between the two lifeboat stations as on 17 March 1969 the Longhope Lifeboat 'T.G.B.' 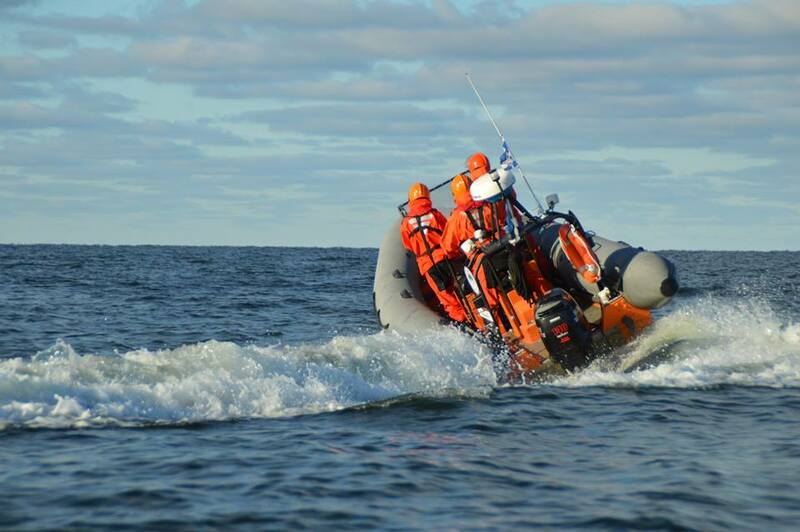 ON 962 capsized while on service to the Liberian vessel 'Irene' and her entire crew of eight lost their lives. It was lovely to meet Kevin and his crew - fair winds & following seas. A big thank you to the friends of David Redhead who recently held a party in his memory at his local pub, 'The Blue Cow', in South Witham, Lincolnshire, raising £65 towards the Penlee Lifeboat Station Appeal. David and his family lived and worked in Mousehole for many years. It's really nice when you see a great bunch of young people doing something positive for their community. Alex, Joey, Harvey, Harry, Will & Will from Penzance & Newlyn RFC, gave up a full day of their half term holiday to sell bags of sweets outside Lloyds Bank, Penzance. Well done boys you are an absolute credit to your Rugby Club and to your families. 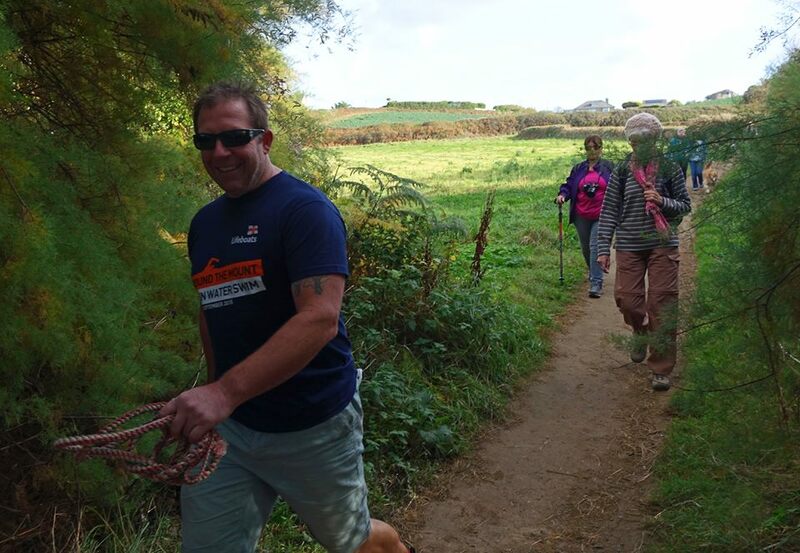 Congratulations to the Penlee Fundraising branch for organising another Penlee Lifeboat sponsored walk. Eleven people walked plus 5 dogs on a lovely morning from Perranuthnoe to the lifeboat station at Newlyn and so far have raised over £1,230 for the station appeal. 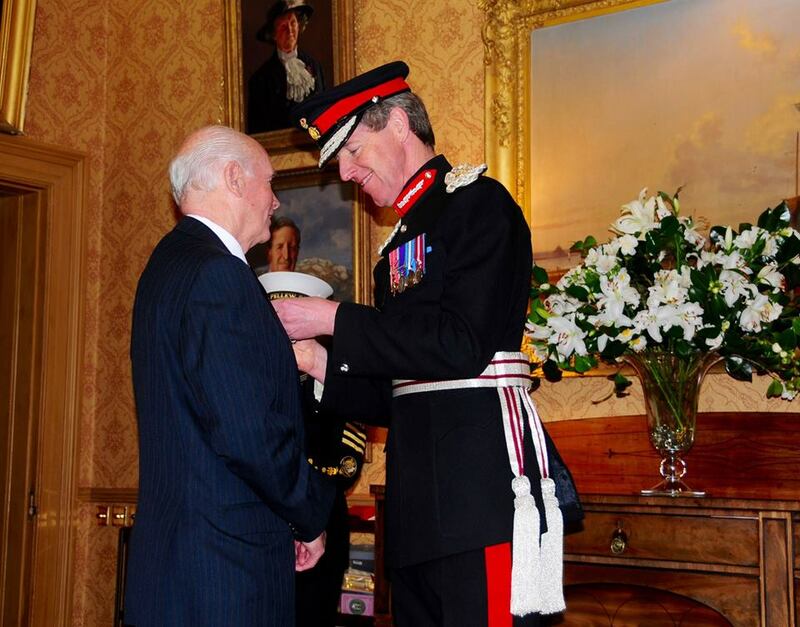 It is with a deep sadness that we share the news that our former colleague & friend, Frank Wallis, has passed away. 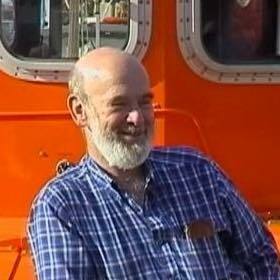 Frank was a very well-respected lifeboatman, fisherman and Harbour Master at Mousehole. He served on the Solomon Browne lifeboat with his brother, Phil Wallis, as crew and then 2nd Coxswain. 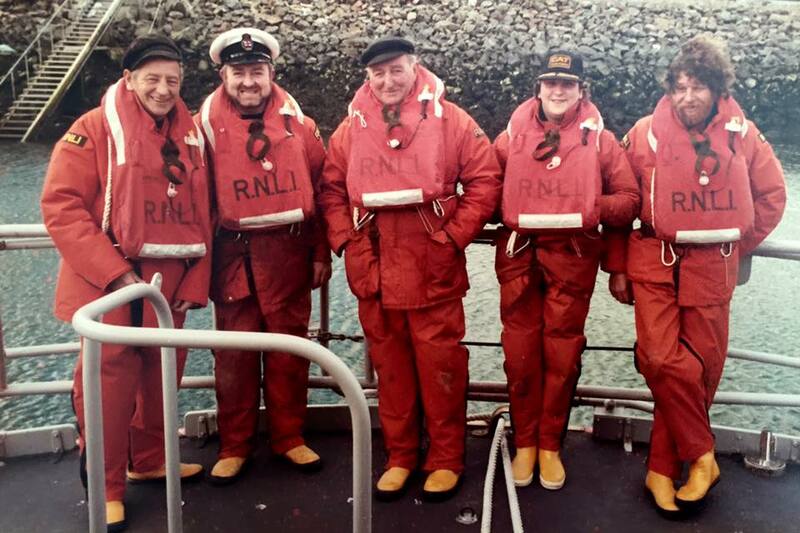 After the loss of the Solomon Browne in 1981, Frank continued to volunteer on the RNLB Guy and Clare Hunter and the RNLB Mabel Alice, giving many years of loyal and dedicated service to the RNLI. Frank held awards on velum from the RNLI for his role in some of the dangerous services he attended over the years such as the 'MV Lovat' disaster in 1975. Frank was a lovely man who would always greet you with a smile and a kind word. He will be sorely missed by all that knew and loved him - gone but never forgotten. A big thank you to Anna Murphy & friends who raised £241.40 towards two local charities at the Paul Feast Story Night on Monday night. Half of the monies raised will go to the Penlee Lifeboat Station appeal. Our volunteer Visits officer (Youth and Heritage Education), Martin Brockman, was invited along to give his heritage talk for the Penwith 50+ Forum group. Martin gave a shortened version of his full history of the Penzance, Newlyn and Penlee lifeboat presentation which was, as usual, very well received. The presentation was attended by over 30 locals. After the Presentation had finished they all had refreshments and Martin was presented with an amazing £86.53 for Penlee. 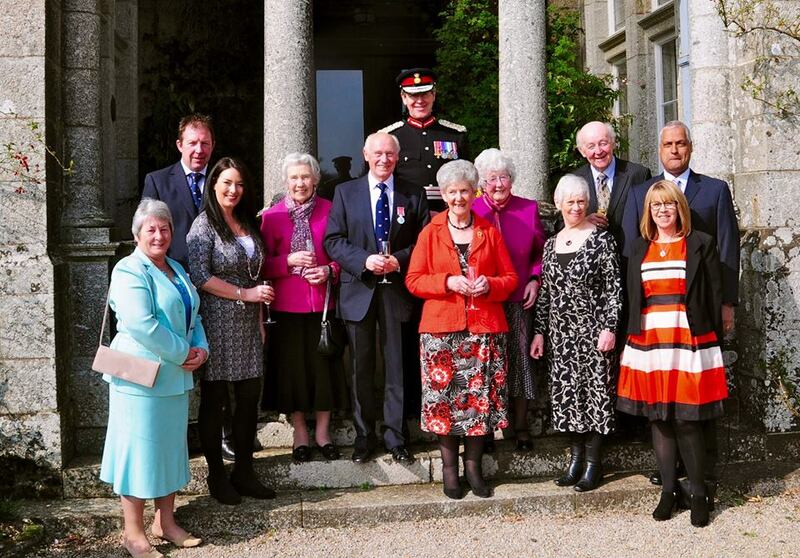 Thank you to the members of the Penwith 50+ Forum. If you are interested in requesting an education talk on the RNLI or Penlee Lifeboat station, please contact our Lifeboat Visits Officer - under the 'contact us' menu. Our talks last from 30 minutes to 1hour 20mins. Our Volunteer Lifeboat Visits Officer, Martin Brockman, gave his history of the Penzance, Newlyn and Penlee Lifeboats presentation in Paul Church as part of Paul Feast week. The presentation was well attended with nearly 60 people turning up on a cold autumn evening. Martin's presentation covers the whole history of the lifeboats and stations from 1803 to present day. After the presentation Martin took a few questions and then everyone retired to the back of the church for refreshments. Proceeds from the evening were going towards the restoration project of the East facing church window which is starting to deteriorate and in need of immediate attention. Many thanks to all of those who supported the event, and shared their stories with Martin. 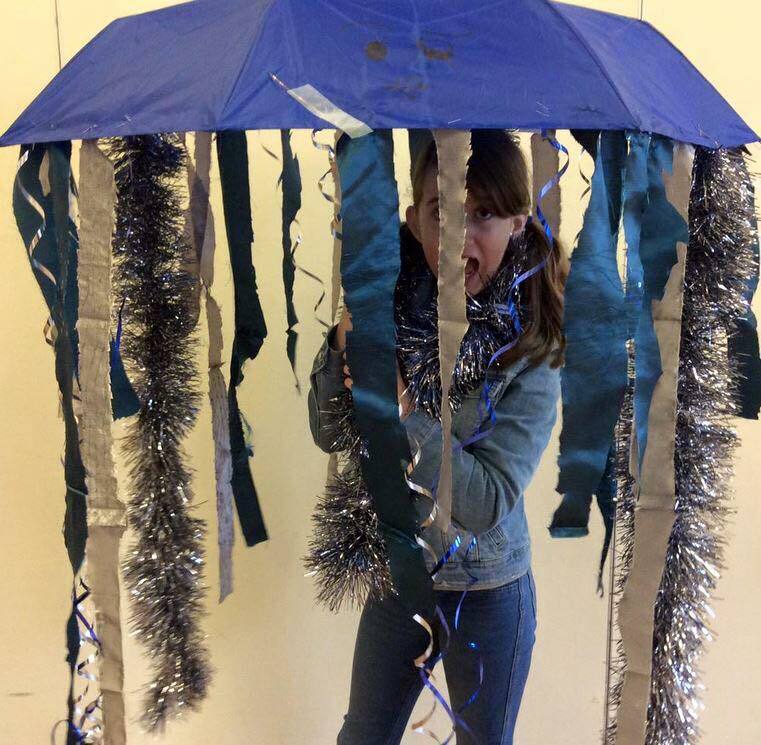 What a fantastically fun and fishy day St Gabriel's Junior School in Newbury, Berkshire have had! 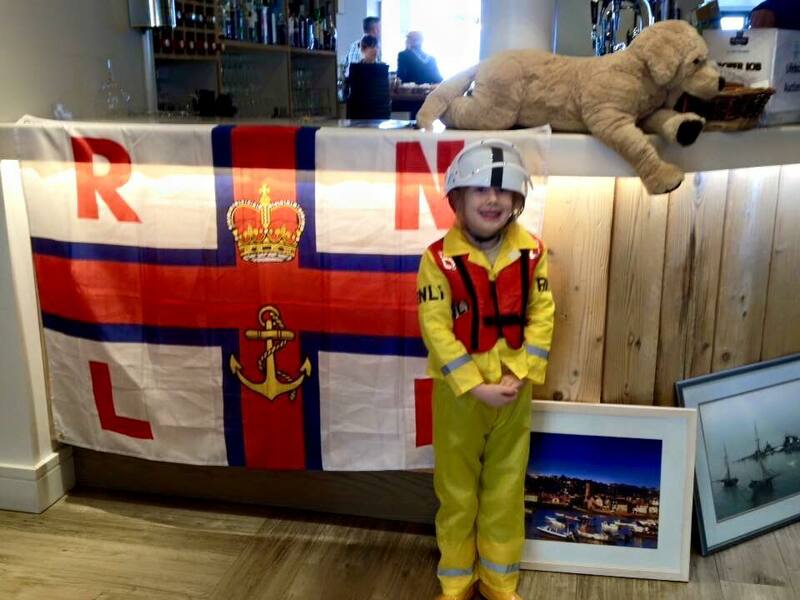 Joining in with the National RNLI 'fish lunch/supper' fundraising day the children, and mascot Mowzer the Mousehole cat, have enjoyed sea rescue activities, yummy fish for lunch and learnt about the fantastic job all our brave volunteers do to 'save lives at sea'. In total the children have raised £130.50, which will be going to the Penlee Lifeboat Station appeal. Teacher, Sarah, presenting Coxswain Patch Harvey with the cheque for £130.50, which will be going to the Penlee Lifeboat Station Appeal. Thank you and well done St Gabriel's Junior School! Mounts Bay Academy in Penzance has a longstanding connection with Penlee Lifeboat station. 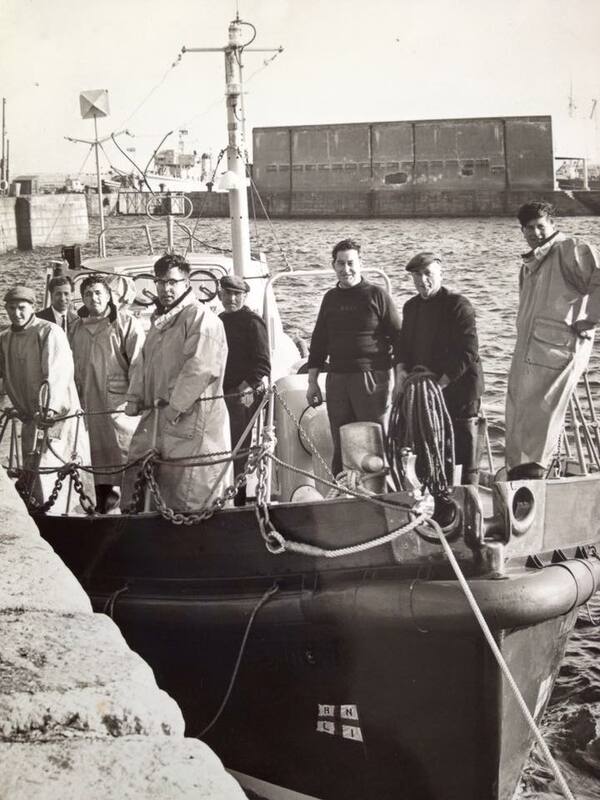 Lots of former pupils are current and past members of the Penlee crew and volunteers, in fact some of the ill-fated crew of the 'Solomon Browne' were ex Mounts Bay Pupils. The relationship continues strong to this day with Mathematics teacher Mr Sam Kent as one of Penlee's volunteer crew. To help raise the profile of the Penlee station appeal, he delivered a Year 7 mathematics lesson - dressed in his lifeboat crew Kit. 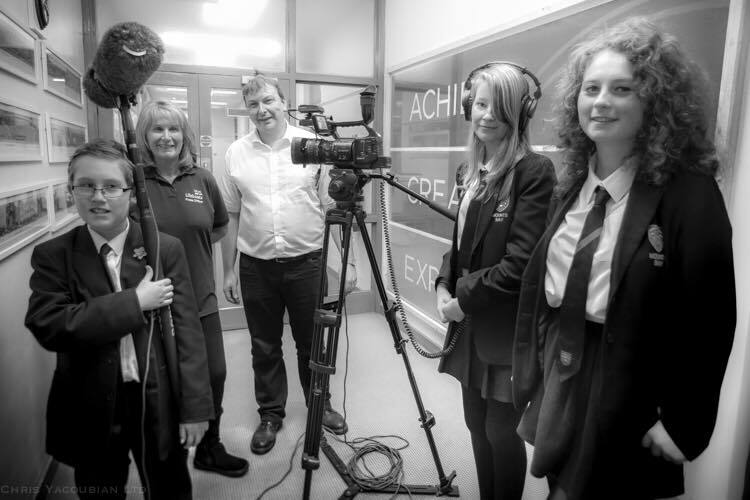 Members of the Academy's media department assisted some of the pupils to film and interview Sam and also some of the other volunteers who were invited to the day. Martin Brockman, whose father died in the disaster and is now the Penlee volunteer education officer along with Elaine Trethowan, Penlee's volunteer Press officer (both are former students of the school) were interviewed. You can see the 'BBC school report interview' here. 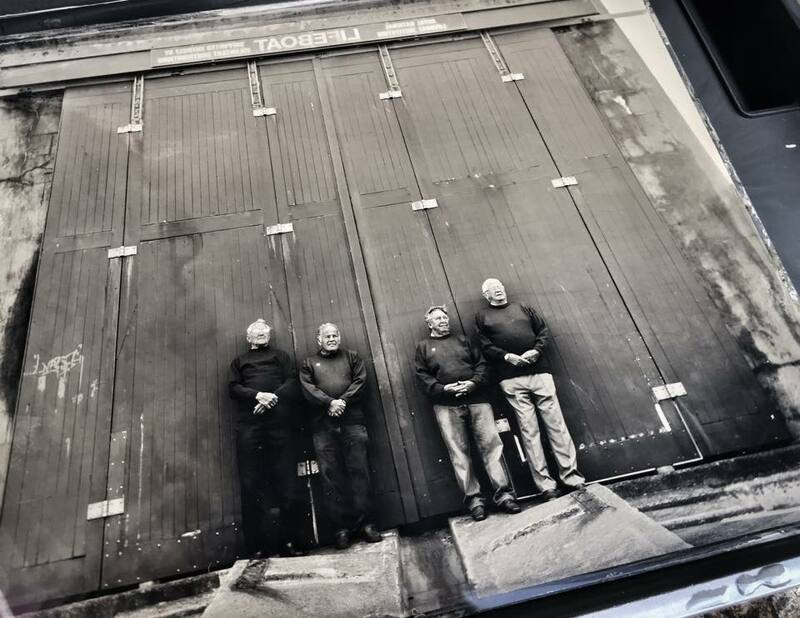 Photographer Jack Lowe is travelling to all 237 RNLI Lifeboat Stations in Britain & Ireland to document the stations and people. 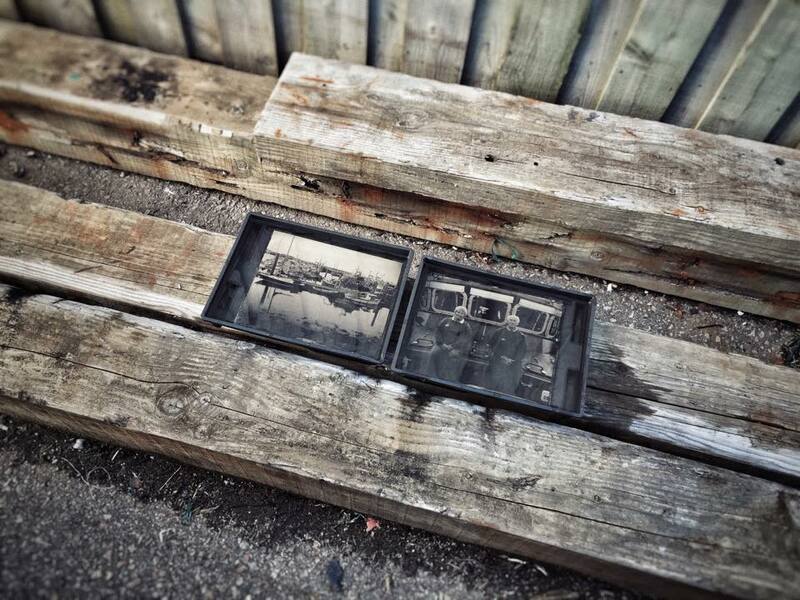 Known as ‘The Lifeboat Station Project’ Jack is using Victorian photographic methods and some very old equipment to achieve his goal. 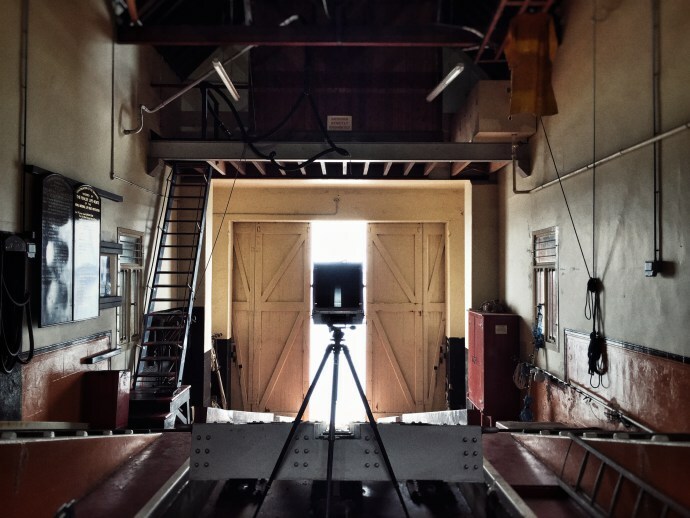 Travelling in his mobile dark room, we were privileged to host him last week at Penlee. 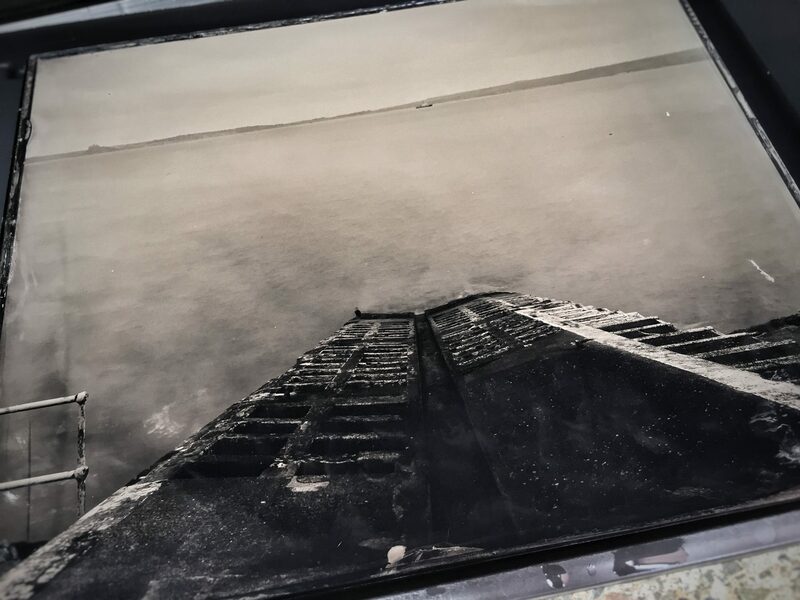 Jack said himself in his earlier posts, he was looking forward to Penlee to help record its heritage, but also to visit the station and poignantly stand on the slipway at the old boathouse on Penlee point. A day at the 1983 built crew accommodation in Newlyn Harbour and some exquisite images of the Severn class ‘Ivan Ellen’, the Atlantic 75 ‘Paul Alexander’ and of course the crew, followed by a day at the old lifeboat slip at Penlee point. At Newlyn along with the current Cox and his crew, Jack met Janet Madron BEM (Our Branch Chair, widow of the late Stephen Madron and long-time supporter of Penlee) and Roy Pascoe BEM (Our Boathouse manager, retired crew of the Penlee lifeboats and retired DLA). At Penlee Jack got to meet some of our more colourful characters. Some of the retired crew of lifeboats past visited Jack and the banter began! Nim Bawden (retired crew form the Solomon Browne), Leslie Nicholls (Retired crew from the Solomon Browne and then the Relief boats post disaster), Dudley Penrose (Retired Head launcher at the Penlee slip) and Raymond Pomeroy (Retired Head Winchman at the Penlee slip). They were like a bunch of ‘Naughty boys’ all reminiscing and telling stories of their experiences at Penlee. It all started when Dudley first saw Jack, asking him if he was shoeing horses (Because of his leather apron), then Raymond had to have some help to change his jumper! Before you knew it the whole place was in uproar! It was good to hear the sound of laughter and mischief ringing around the rafters of the old boathouse once again. Jack stayed in Mousehole and became quite an icon, people stopping and asking him about his work, which is amazing. Some of his work is posted on facebook or look at his website, his blogs are a must and the images he has captured are like no other. 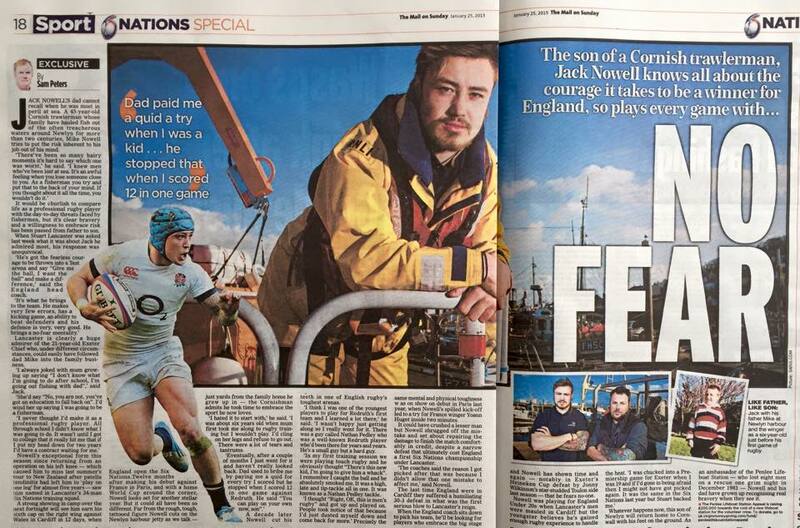 Thank you to all who helped Jack, turned out to support him and also those who buy his work to fund his project. His prints are very limited in numbers and are selling fast (Prints can be seen and ordered on his website). Thank you to Jack for coming to Penlee and allowing us the chance to participate in your project – Good luck! We were very honoured to welcome six crew members from the Voluntary Maritime Rescue Unit of Toila to Penlee Lifeboat Station. Toila is a small coastal town located in the Northeastern part of Estonia, around 50 km from the Russian border at Narva Bay (part of Gulf of Finland). Mehis Luus and five of the volunteer crew are taking part in a study visit to the RNLI and chose Cornwall as part of their tour. 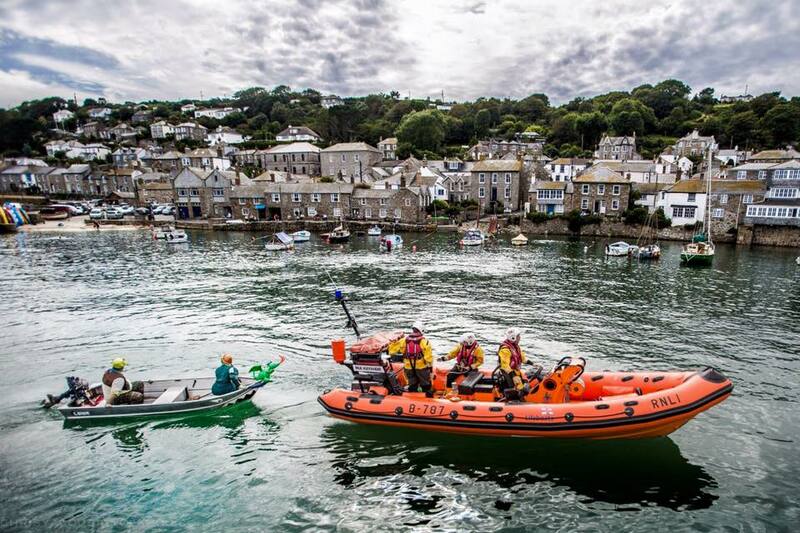 Whilst here they will also be visiting other stations at Falmouth, The Lizard, Sennen and St Ives lifeboat. 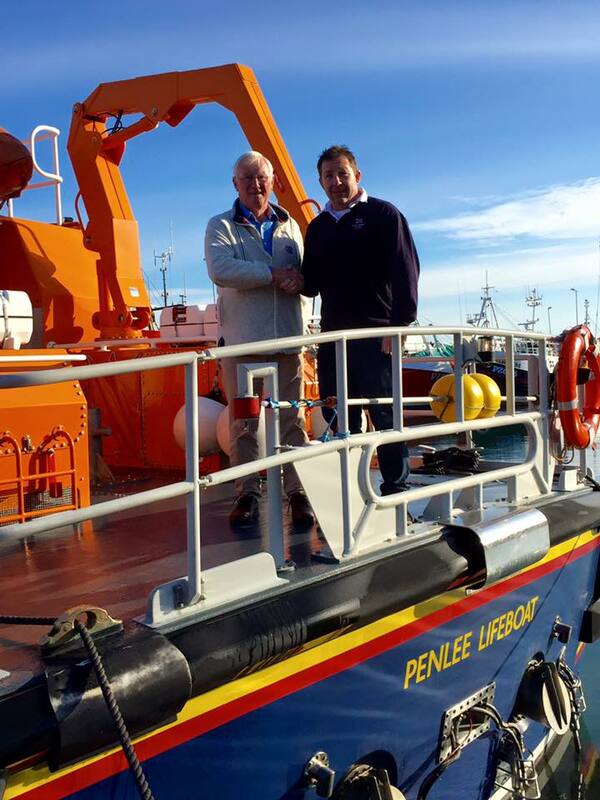 Their visit was hosted by Coxswain, Patch Harvey, and Penlee Lifeboat Visits Officer, Martin Brockman, who both got a very interesting view into how the maritime rescue unit in Estonia works. They close down for the winter as part of the gulf freezes over, so rescue by boat is impractical (Maybe they need a hovercraft!). With temperatures for 6 months of the year in minus figures, these crews really do know first hand how exposure can affect rescues for both the casualty and the crews. They also need to watch their position at sea very closely, if they wander into foreign waters beyond their country's boundary, they can get into serious trouble, even risk being arrested! At Toila they have a 21ft inflatable LB (not too dissimilar to our old Atlantic 21's) with a single 140HP Suzuki outboard, funding is similar to the RNLI, all voluntary, and at times these guys even have to supply their own fuel. They were particularly interested in seeing our boats and took an interest in the support teams that we are blessed to have. Fundraising is key to the RNLI's success and that is one aspect that the Toila crews thought we are doing exceptionally well. They have open days like ours and judging by the images on their station facebook page, they have as much interest as ours. It was a pleasure to meet them and to hear about the maritime rescue work they carry out in Estonia. 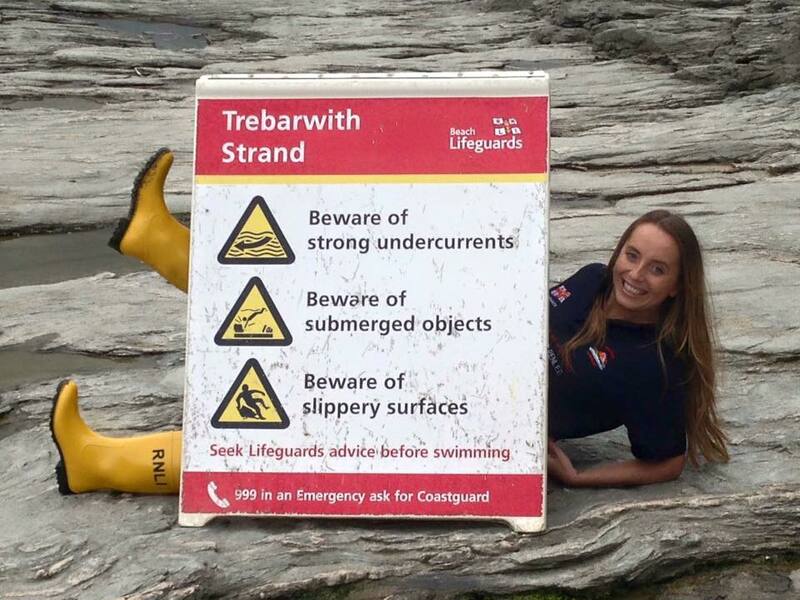 Sadie, our very own RNLI volunteer, paddled her way around 28 beaches, travelled 300 miles and raised an amazing £632.50 on her 'Paddle for Penlee' challenge today. Poor weather conditions earlier in the day, and the approach of darkness, meant that Sadie was not able to visit all the lifeguarded beaches in Cornwall. With Sadie's safety in mind, and on the advice of the RNLI, she returned to Penlee Lifeboat Station just after 9:00pm this evening. You did an amazing job Sadie - well done and thanks from us all at Penlee. Fanfare of Trumpets! 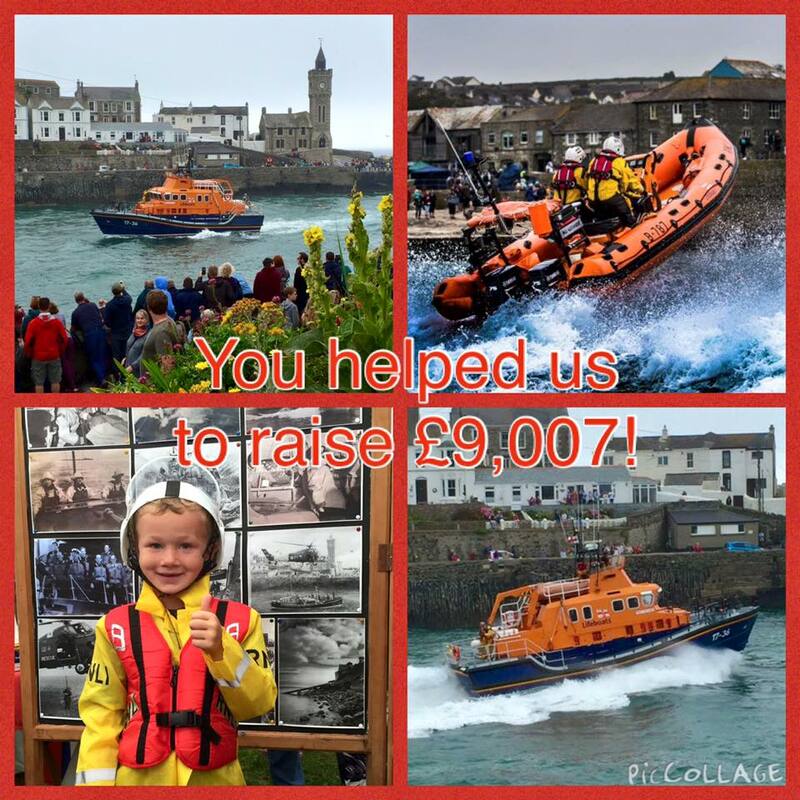 With your help and generous donations we raised an amazing £9,007.00 (net) at this year's Porthleven Lifeboat Day. A big thank you must go to everyone who supported our event, to the businesses in Porthleven and beyond who provided raffle & auction prizes, to all the other lifeboat branches who attended and collected on the day, and to all our wonderful RNLI volunteers who gave up their time & energy to make Porthleven Lifeboat Day 2015 such a huge success. Thank you Porthleven and District RNLI branch - you are amazing supporters of the RNLI and particularly the local stations in Cornwall. We look forward to doing it all again on Sunday 14th August 2016 - hope to see you there! 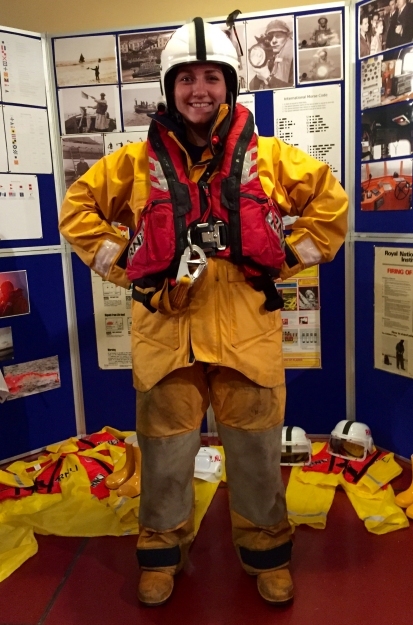 Crew member Sam Kent recently travelled to RNLI College in Poole, Dorset, to complete the Trainee Crew Course. A key part of the course is the sea survival element, which enables new volunteer crew to be trained in a variety of crucial subjects including how to ‘abandon ship’ with a 4m jump into water; team survival swimming and coping in a liferaft in simulated darkness; how to deal with fires aboard lifeboats; how to right a capsized inshore lifeboat; and the importance of lifejackets. As part of the National Heritage Open Days, the country’s largest FREE heritage festival, The Telegraph Museum at Porthcurno invited the Penlee heritage team along to the event. 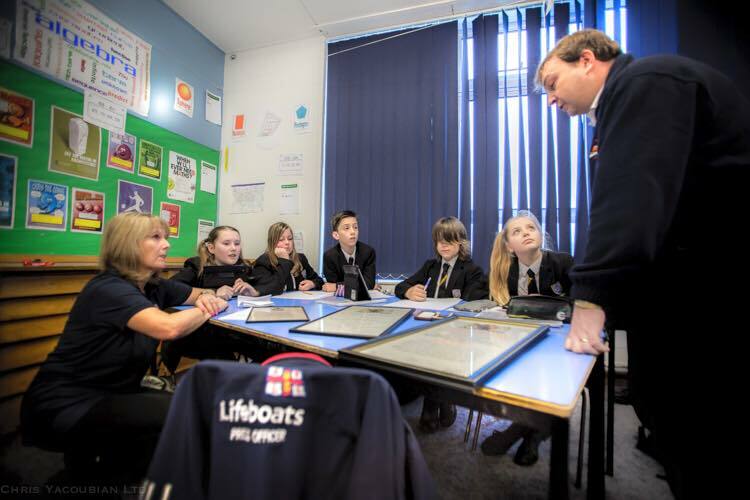 We were asked to put on a display and deliver some presentations about the history of lifeboat communications to add to their 'Ship to Shore' theme. Our Lifeboat Press Officer - Elaine Trethowan, Lifeboat Visits officer - Martin Brockman and Crew member - Sam Kent went along with an impressive display of old and new. Starting with Semaphore flags, through Morse signal lamps, right up to modern radio communication, the history of the lifeboats at Penzance, Newlyn and Penlee was told particularly how they communicated. The team also took along children's dress-up and some actual crew kit for the visitors to try on. Colouring-in, 'Stay Safe' Magazines, flags and pencils were well appreciated by the children, whist the adults listened to Martin presenting a brief history slide show and asked the team many questions about Penlee's rich Heritage. Many thanks to all of those who attended the day (Over 400 visitors streamed past) and those who showed an interest in what we had to display and talk about. Many thanks to the team at the Telegraph Museum for hosting the event, inviting us along and making the tea! 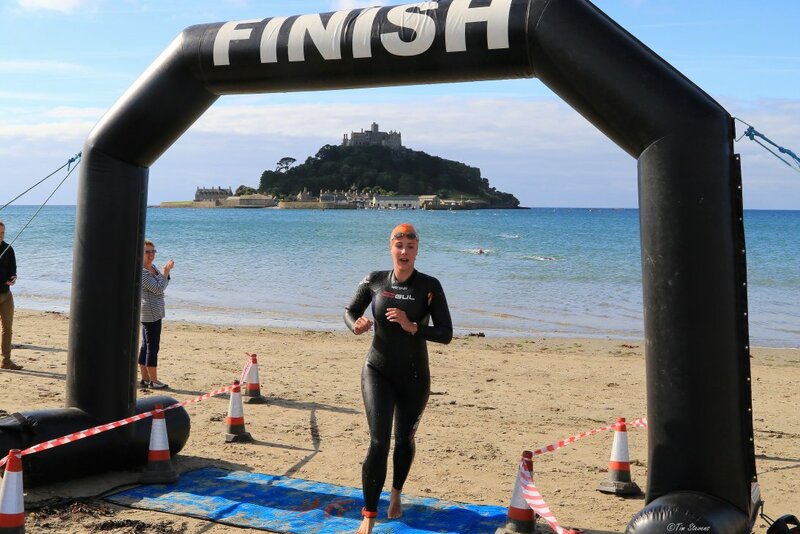 With the sun shining over Mount’s Bay, calm sea conditions, friends and family cheering from the shore, 52 brave open water swimmers, with an age range of 28-57 years, entered the water at Marazion beach and swam off around St Michael’s Mount in a clockwise direction. They were watched over by the Ivan Ellen & Paul Alexander lifeboats, RNLI Lifeguards, Penzance Sailing Club safety boat, and members of the Penzance Canoe Club. Competitors travelled to Marazion from all over the country to take part – Birmingham, Cambridge, London, and Rotherham, South Yorkshire. 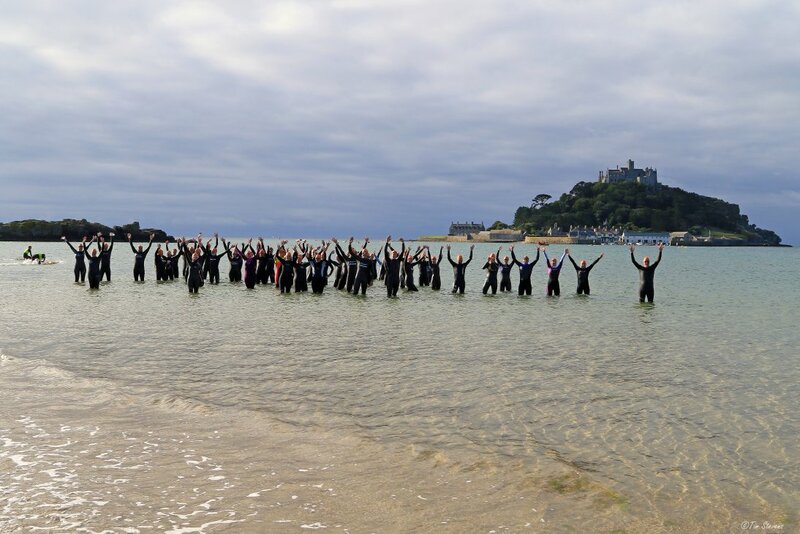 Each one had a different reason for embarking on this one-and-a-half mile route around the iconic St Michael’s Mount. There were 32 male, and 20 female competitors, one of whom had only been swimming for 6 months – her swim buddy also managed to complete the challenge without disturbing her perfectly applied bright red lipstick. 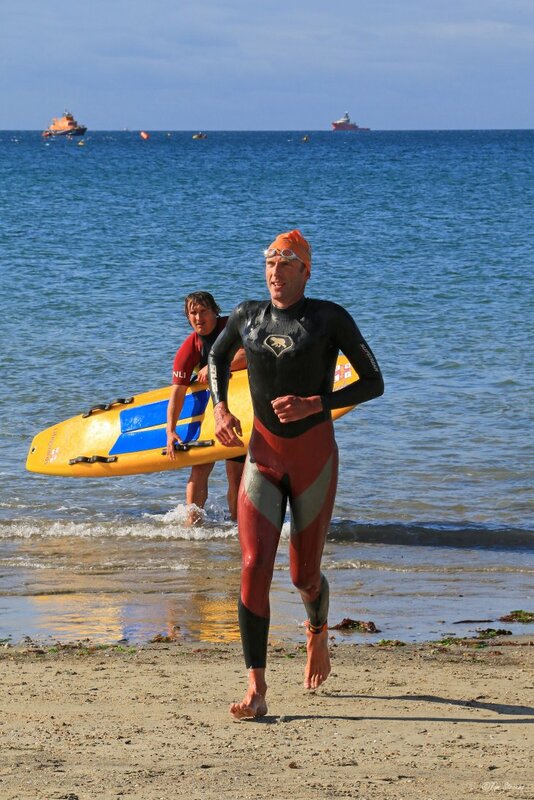 Fourth over the line and first female swimmer to cross was Rhianne Robinson who completed the event in 00.45.02. The overall times ranged from 38 minutes to 1hour 45mins. Many thanks to the Crew and volunteers of the Penlee lifeboat, the Penwith Lifeguards, the RNLI community fundraising support team, Penzance Sailing Club safety boat, Penzance Canoe Club and all of those who turned up to help, participate, fundraise, marshal, watch, support and contribute. 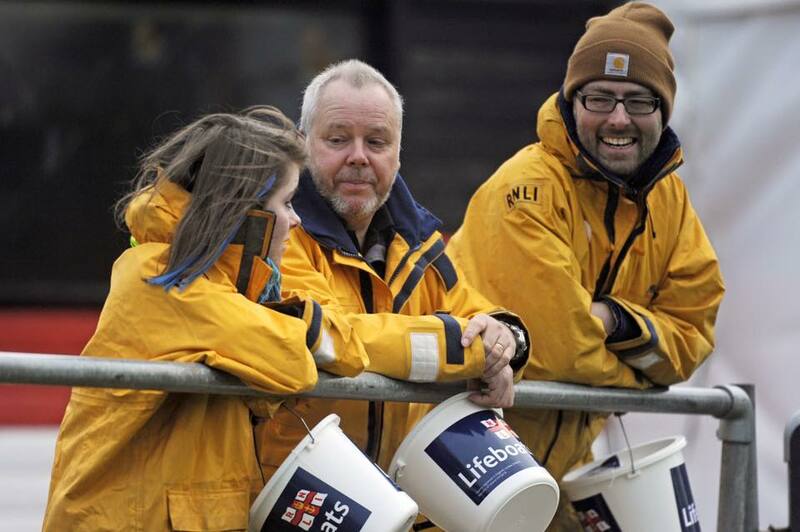 Together you helped to raise over £6,000 towards the Penlee Lifeboat Station appeal - a fantastic result! Together we will build a new lifeboat station. It's been a very busy bank holiday weekend for the volunteers at Penlee. 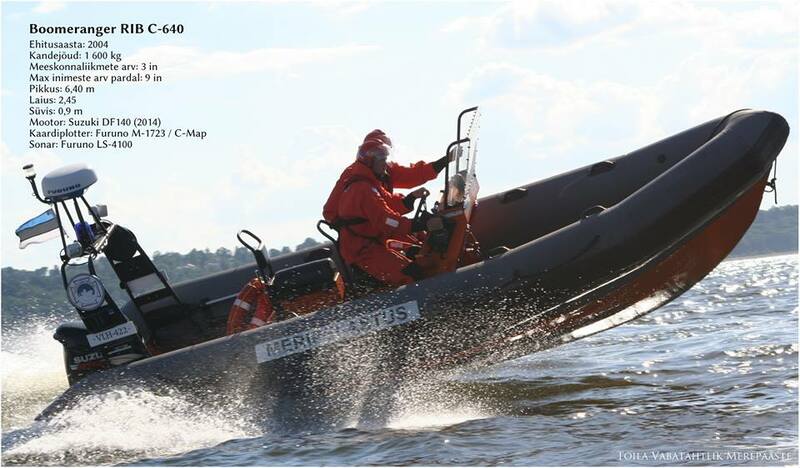 Our crews have been out 6 times supporting events and other duties and twice on service calls. Friday the ILB and Y-boat for the one mile open sea swim, Saturday morning the ALB to scatter ashes and in the afternoon all boats supporting the Mousehole punt race, Sunday saw the ALB launch for another ashes scattering and the in the afternoon the ILB and Y-boat supported the Newlyn raft race. 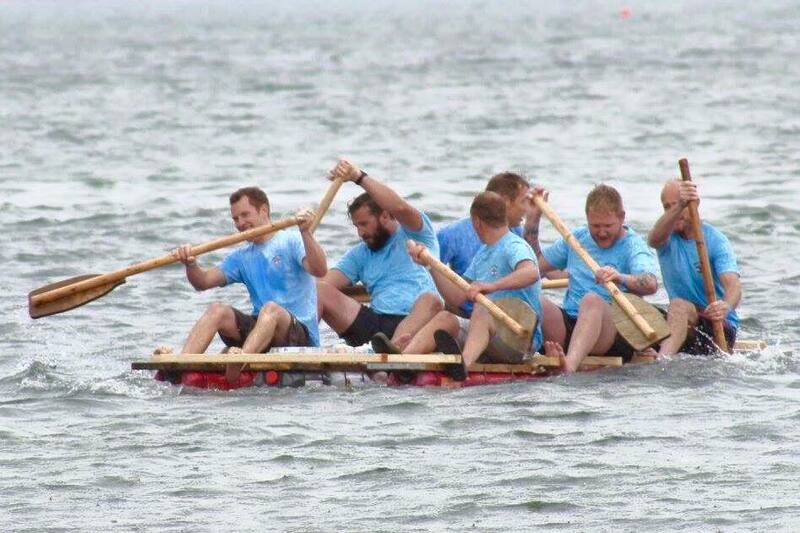 The Penlee lifeboat team won the Newlyn raft race despite nearly being disqualified for being armed with rather a lot of flour and eggs! it wasn't to throw, it was emergency rations just in case an energy boost was required (Honest). Bank holiday Monday was of course Newlyn Fish Festival. 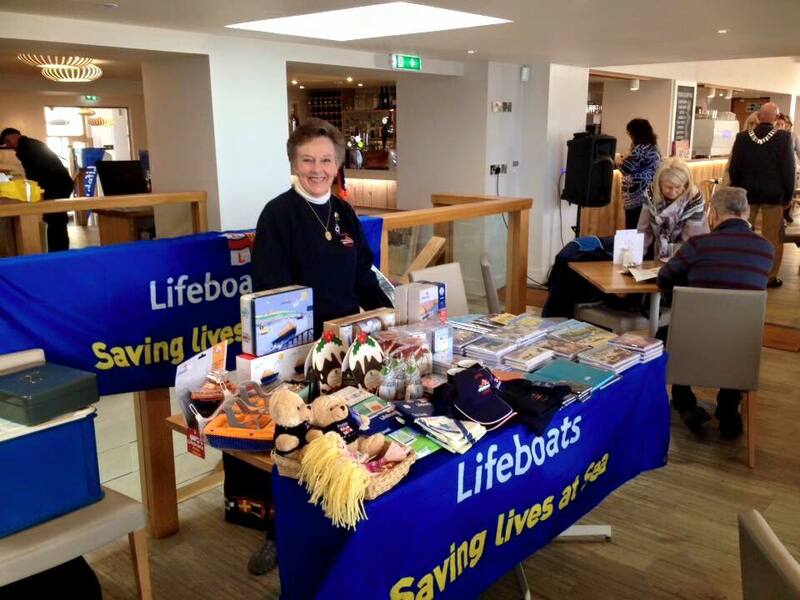 The crew were on hand to open the lifeboats for viewing and the fundraising team selling souvenirs, cakes and teas in the boathouse. 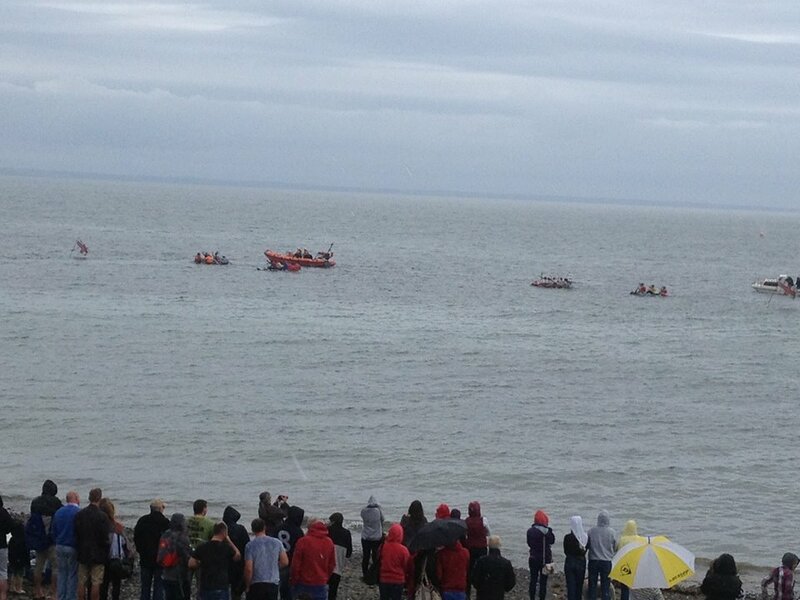 Then the Crews took to the sea for the Gig racing outside the harbour. On top of all of this, the pagers went off requesting launch of both boats on Sunday evening at 8.32 to assist 2 persons off Praa Sands, fortunately the lifeboats were just leaving the harbour when the coastguard stood them down as the persons were found safe and well on land. Then the pagers went off during the Fish Festival on Monday Morning at 11.18 requesting launch of the Inshore lifeboat to collect an abandoned Jet-Ski off Marazion. 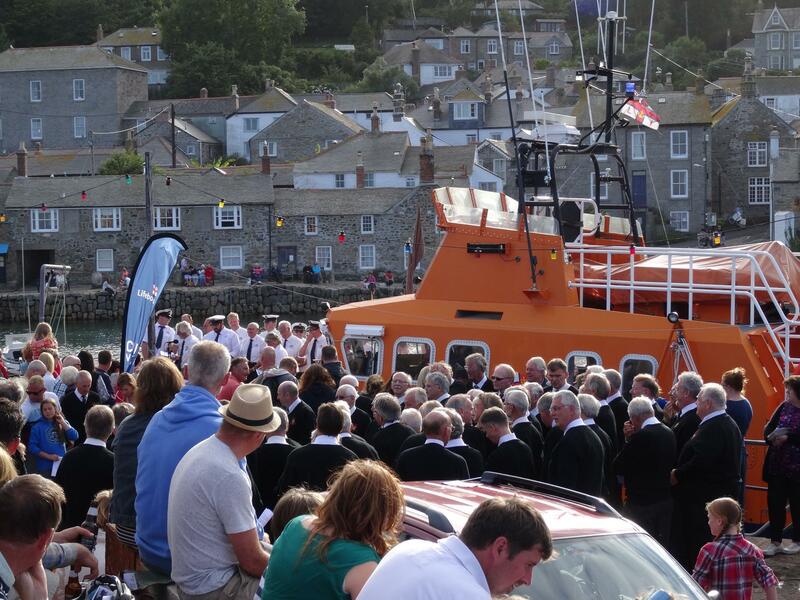 Members of the Penlee team 'went North' to St.Ives on Saturday to support St.Ives lifeboat day. One very, very busy time for the crews and fundraisers at Penlee, our volunteers give up 1000's of hours between them each year to keep our station open, particularly on key dates when everyone else is having a day off! Please support them by supporting our events. 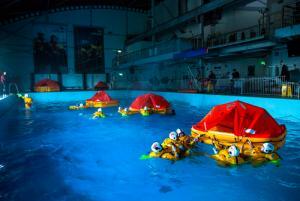 Paul Boulton recently travelled to RNLI College in Poole, Dorset, to complete the Trainee Crew Course. A key part of the course is the sea survival element, which enables new volunteer crew to be trained in a variety of crucial subjects including how to ‘abandon ship’ with a 4m jump into water; team survival swimming and coping in a liferaft in simulated darkness; how to deal with fires aboard lifeboats; how to right a capsized inshore lifeboat; and the importance of lifejackets. In warm August sunshine hundreds of visitors came to the Penlee Lifeboat Crew Day and the blessing of the 'Ivan Ellen' & 'Paul Alexander' lifeboats in Mousehole Harbour. The crowd were treated to a spectacular rescue display involving both Penlee Lifeboats and Rescue 193 - 771 Naval Air Squadron. Sadly, this is the last joint exercise with Penlee before the squadron disbands early next year. The Crew Day this year coincided with the Mousehole Carnival weekend, so anyone who attended not only had the stalls and entertainment provided by the Penlee RNLI branch, but also the whole village was awash with people enjoying the numerous other stalls, BBQ's, hog roast and bar. The old lifeboat station at Penlee Point also opened for 2 hours from 10am until midday. 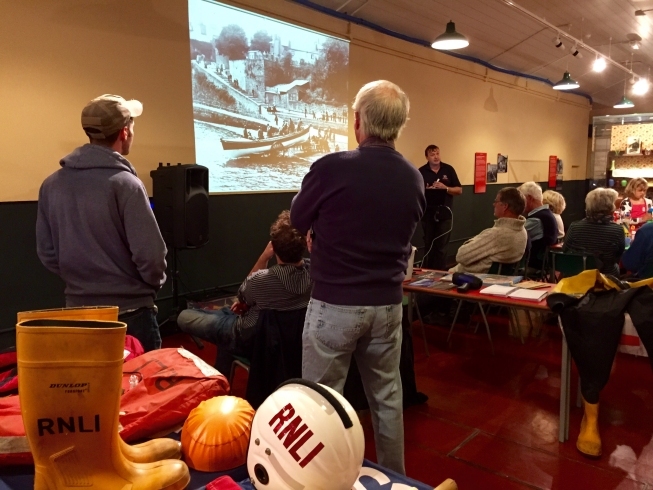 150 visitors streamed into the building and were thrilled to share the history of this iconic lifeboat house. 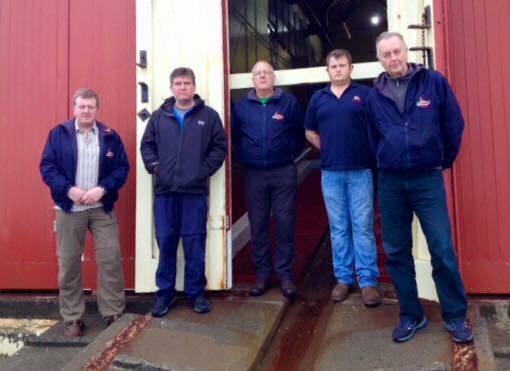 The Penlee lifeboat heritage team were extremely pleased to welcome Nim Bawden to the station. Nim was a crew member in the 1960's and 1970's aboard the 'Solomon Browne' and his stories captivated those who came along on open day. 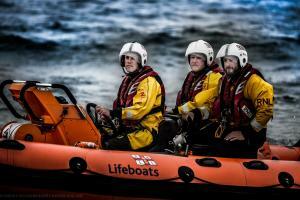 RNLI Coxswain Patch Harvey said, 'It was a fantastic day and the weather was very kind to us. We are not quite sure how much was raised but would like to thank everyone who attended for their continued support and generosity'. We will let you have the final figures of how much was raised as soon as we can, there is a lot to count! Special thanks go to all of those who helped us out, the Penlee Fundraising Branch, the Lifeboat Crew, Shore crew, Supporters, Mousehole Carnival committee, Mousehole Harbour authority, RNAS Culdrose 771 NAS, Penlee heritage team and of course YOU for supporting us. There are many spectacular images taken by the public and some are posted on our facebook page - please click here to visit it. 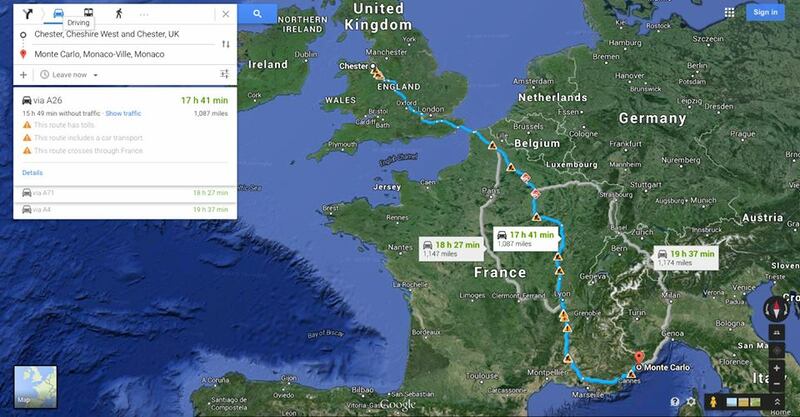 On July 14th 2015 two intrepid travellers on the wrong side of 70 will attempt to maneuver a £300 Mercedes from Chester, England to Monte Carlo, Monaco. Four days of intensive driving, German engineering and choice language will test David Greenhaugh's and Michael Levens' friendship to the max. Under the pseudonym Starsky and Crutch, this fearless duo combine the directional expertise of head navigator and wine sampler Michael and the steady but heavy foot of the indomitable David. 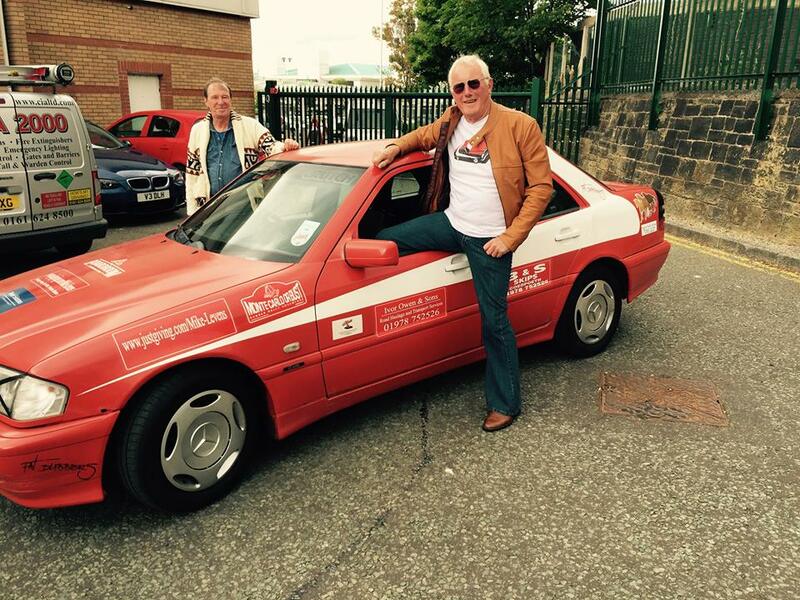 This epic 2,172 mile round trip is being undertaken to support Penlee Lifeboat Appeal. This is a cause that is close to their hearts so any donations will be much appreciated. To date they have raised £2,300 and the figure is still rising. 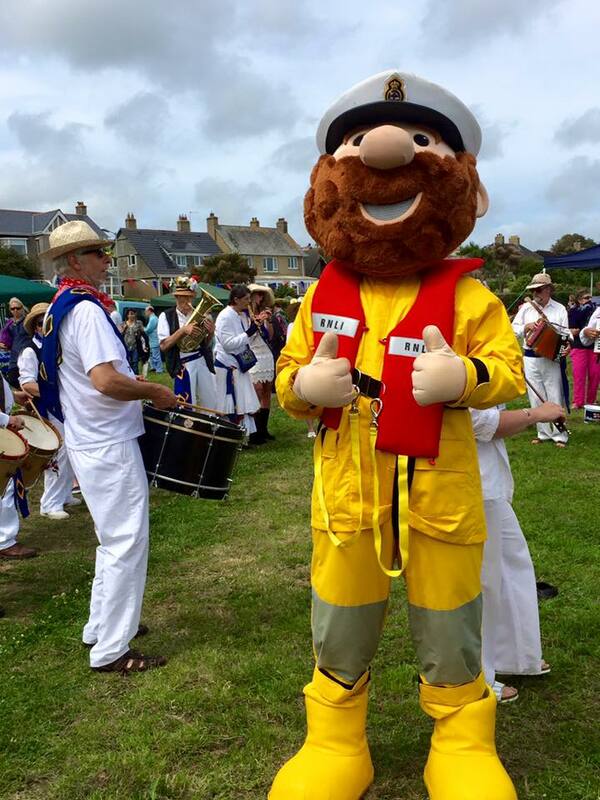 Despite the damp and misty conditions, the 40th Porthleven Lifeboat Day was a resounding success. 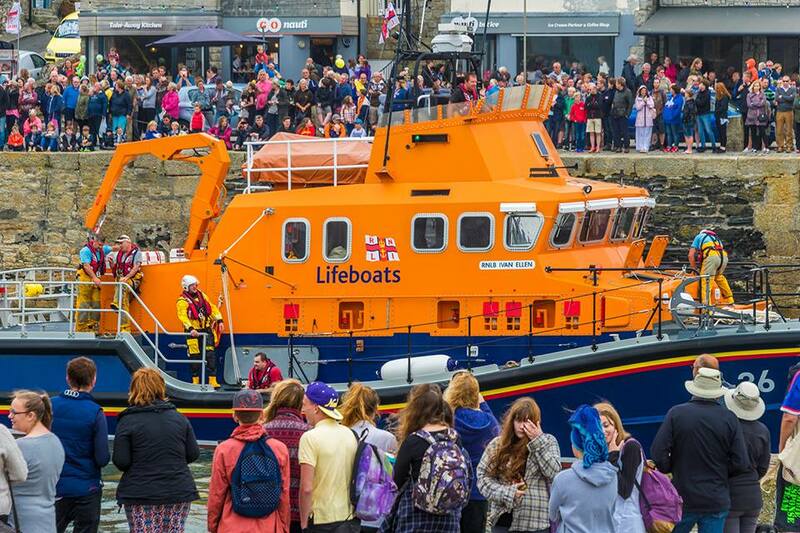 Hundreds of visitors lined the harbour walls and were thrilled to see both Penlee Lifeboats doing what they do best. Sadly, the 771 Naval Air Squadron were unable to join us due to severe fog at RNAS Culdrose. 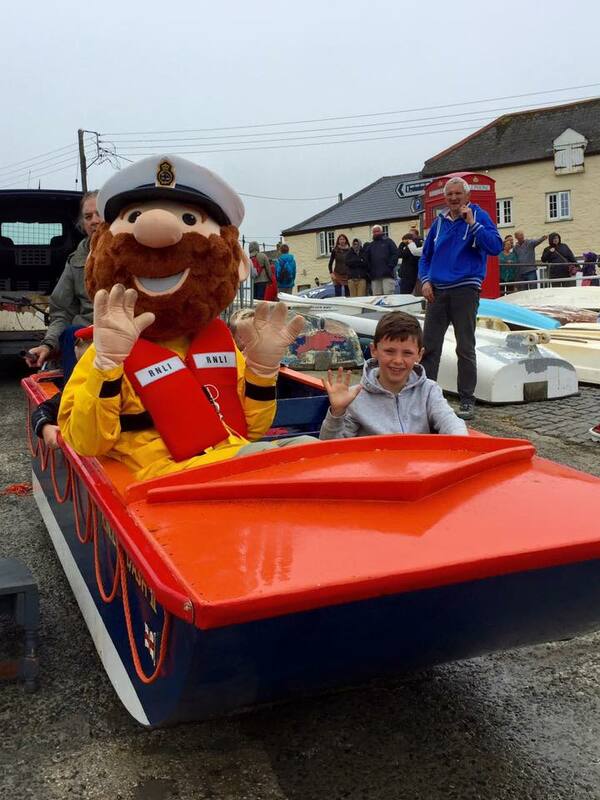 'Stormy Stan' and the 'Kidzone' was an outstanding success and the harbour head Marquee held the model boat display and a heritage section provided by the Penlee heritage team. A big thank you to everyone who came along to support us, to the volunteer crew of the Penlee Lifeboat, and to all the hard working volunteers who made it all happen. It was great to walk around the harbour and see the different RNLI stations embroidered on shirts, showing the support for Porthleven and District branch comes from all our local stations. Diary date: Sunday 14th August 2016 - See you all next year! Thank you to Medusa Piercing, Causewayhead, Penzance who collected £60.28 during the Golowan Festival. This money will go towards our appeal - every penny counts! 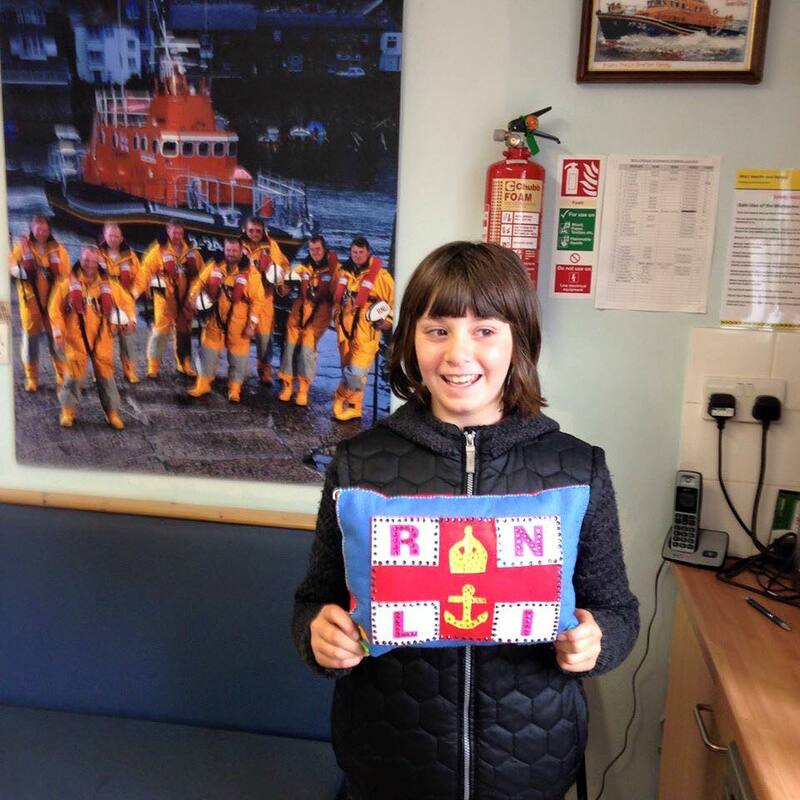 On July 12th, Stacey Thomas aged 10 years, delivered this lovely cushion to the station at Newlyn. She made the cushion herself and would like to sell, raffle or auction it for our appeal. Such a kind and generous thing to do. We put the item on our Facebook page asking for bids in the comments. Closing the bid less than a week later on Friday 17th July, the winning bid was a brilliant £70. Thank you so much for bidding and being so generous, but mostly thank you Stacey for the extremely kind donation. Come and visit our new station soon with pride, knowing you helped build it! Our Inshore lifeboat the 'Paul Alexander' underwent a late "Spring clean" today. 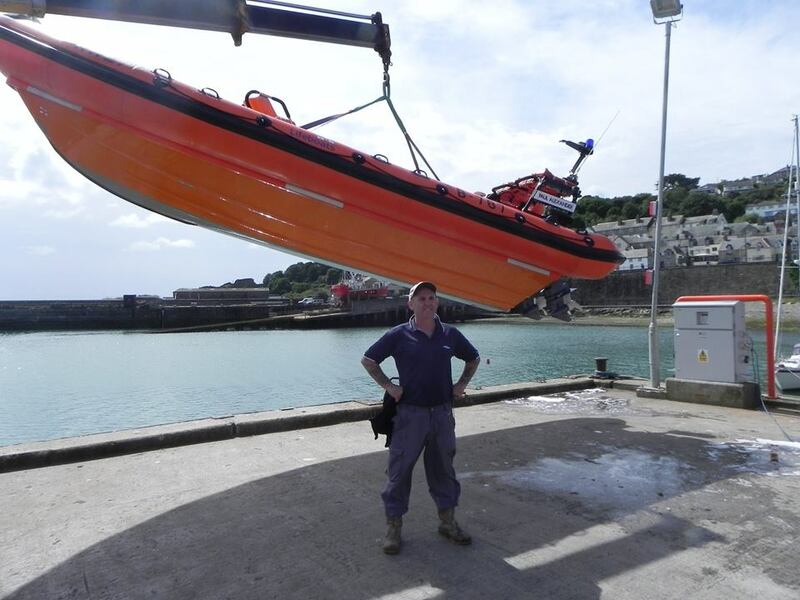 She was lifted out of the harbour at Newlyn and the ILB mechanic, Dave Osborne, gave her a good scrub. Not an easy task as she weighs nearly 1.6 tonnes. A few years ago the lifeboat was kept in the Inshore lifeboat house, but now she's kept on a versa dock and is partially in the water all the time, hence the fouling of the hull. She wasn't out of the water for long, ready for service within minutes! A big thank you from us at Penlee to Kirby Granite who raised an amazing £401.10p in their granite bench raffle at St Buryan Rally. This money will be added to our appeal total and is gratefully received. Many thanks to all who bought a ticket and supported us. 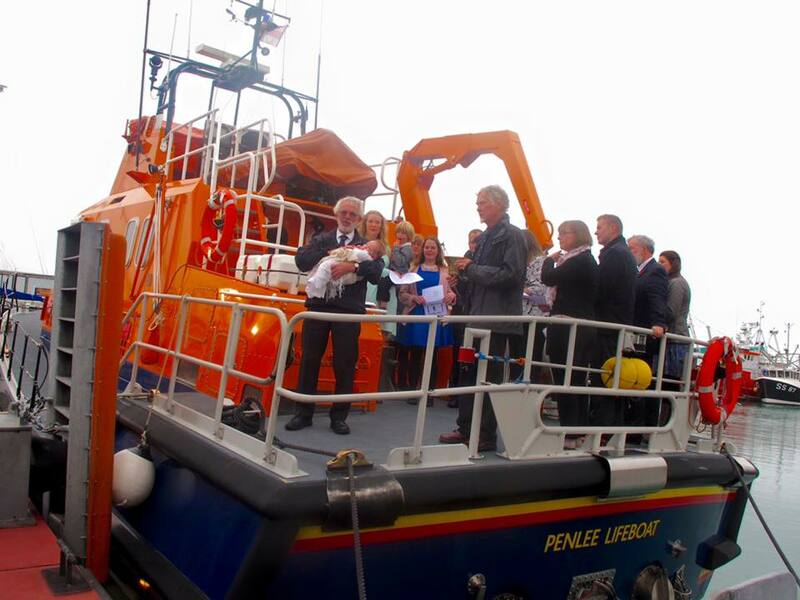 On 24th July 2015 at 7.38pm Penlee received a launch request from Falmouth Coastguard. The Penlee ILB, 'Paul Alexander' was at sea within 4 minutes to the aid of two kayakers off Penlee Point.Falmouth Coastguard received a 999 call from a member of public who saw two kayakers off Penlee Point, one was in the water after capsizing and needed immediate assistance, Penlee ILB was requested to launch, arrived on scene, recovered both casualties and kayaks then returned to Newlyn at 20:00. 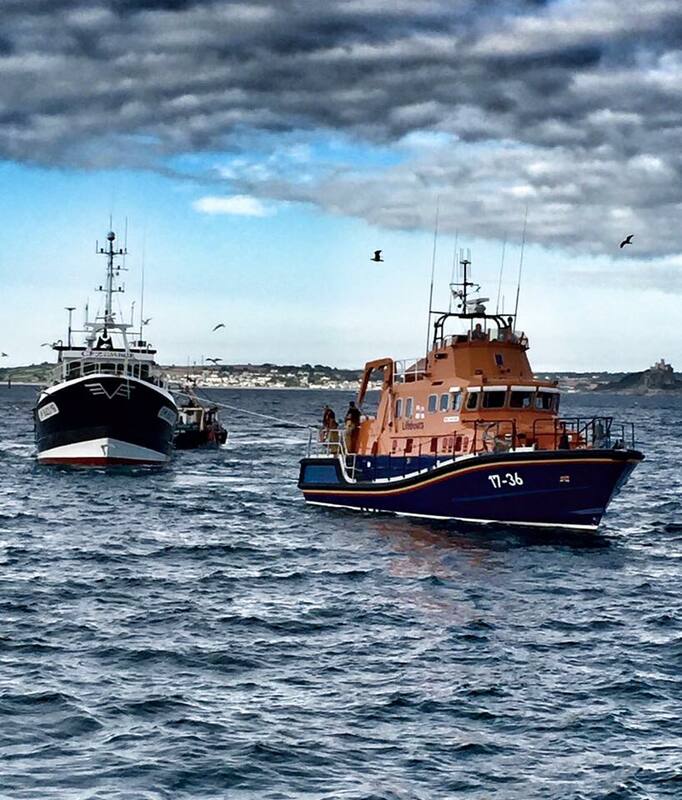 The following day (25/7/15) the following was posted on the Penlee Lifeboat Facebook page from Tom Goode: "On behalf of me and my friend, I would like to say a massive thanks to penlee lifeboat crew for helping back to shore after a sudden change of weather, which caused us difficulty getting back to shore! You all do a great job for the RNLI! Once again thankyou!" Many thanks for the thank you Tom - we don't always get them, but appreciate them when we do! 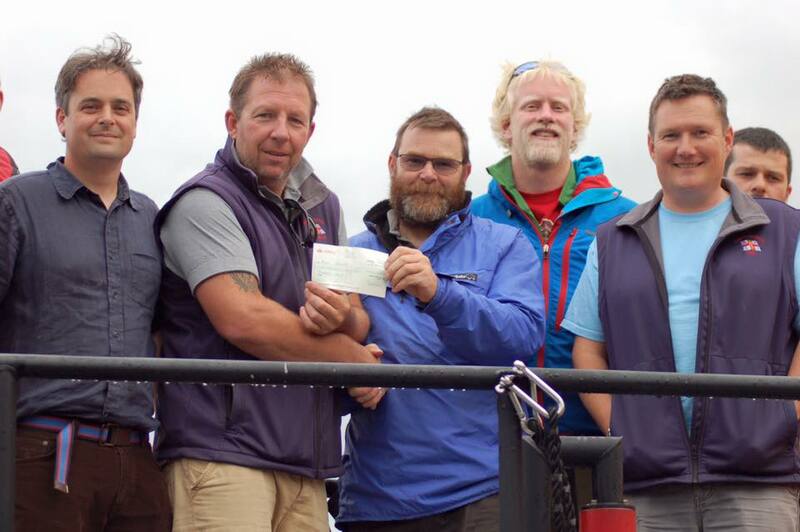 On 24th July 2015 Penlee Coxswain, Patch Harvey, and mechanic, Tony Rendle received a cheque for £300 from the Yorkshire Building Society Charitable Foundation. 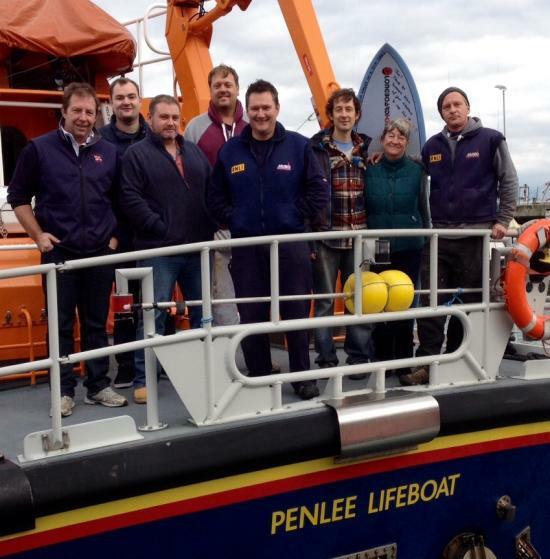 Thank you all who went along to the YBS Agency in Penzance and voted for Penlee Lifeboat. The result was very tight and only a handful of votes separated all three very worthy charities – naturally enough, people found it hard to choose between 3 charities that do so much good in Cornwall. 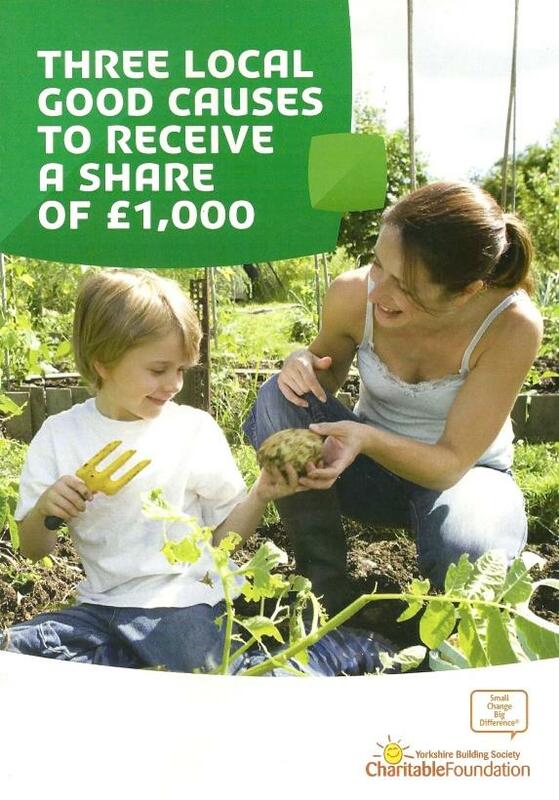 Many thanks to the Yorkshire Building Society Charitable Foundation for helping our Station appeal. One of Penlee's former Lifeboats, 'The Brothers' still going strong, currently a dive support vessel out of Dover. 'The Brothers' Lifeboat (ON 671) was the first motor lifeboat to arrive at Penlee and was based there from 1922 until 1930. A Watson Class, she was the first to be fitted with the new 90 B.H.P. 6-cylinder engine. Her donors were the Misses Eddy of Torquay, who also provided the money for alterations to the boathouse and slipway made necessary by the larger lifeboat. She was transferred to Falmouth Branch and eventually sold on from the RNLI in 1952. Many thanks Sarah Hewes for sending the current photo of the 'Brothers' - it's always great to keep track of our old boats! 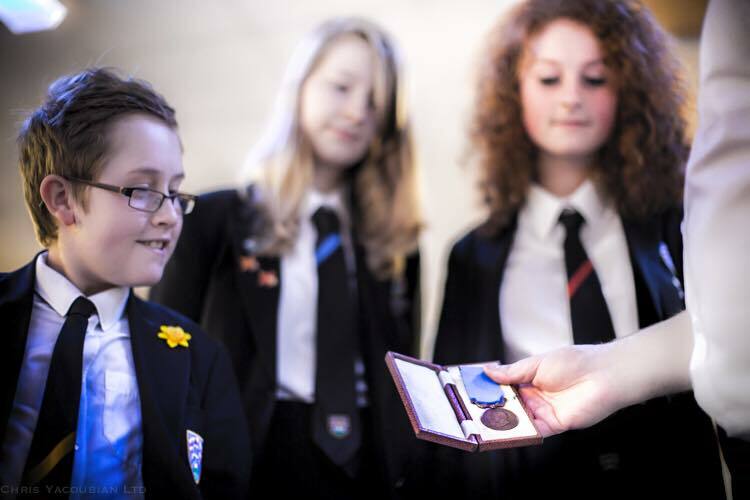 A huge thank you to Bolitho school for joining in with our fundraising. They organised a "coast to coast" walk and through sponsorship money raised an amazing £443.68 towards our appeal. The support we have been getting from our local schools has been immense, demonstrating that our younger community value the RNLI. Each year we try to visit and we welcome all of our local schools to the station. Many thanks Bolitho school - have a great summer holiday! You may recall we asked you to 'vote for Penlee' a few weeks back. Now your help has paid off. Our Press Officer (Elaine Trethowan) and Crew member (Marcel Le Bretton) travelled to Birmingham to attend the award Ceremony. The Result - Fantastic news! 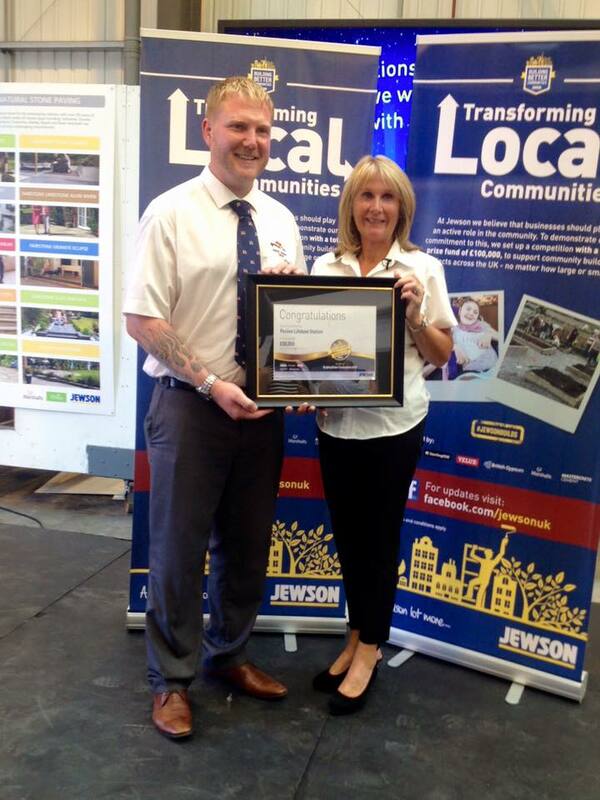 We got the top prize of £50,000 plus the offer of a brand new kitchen! 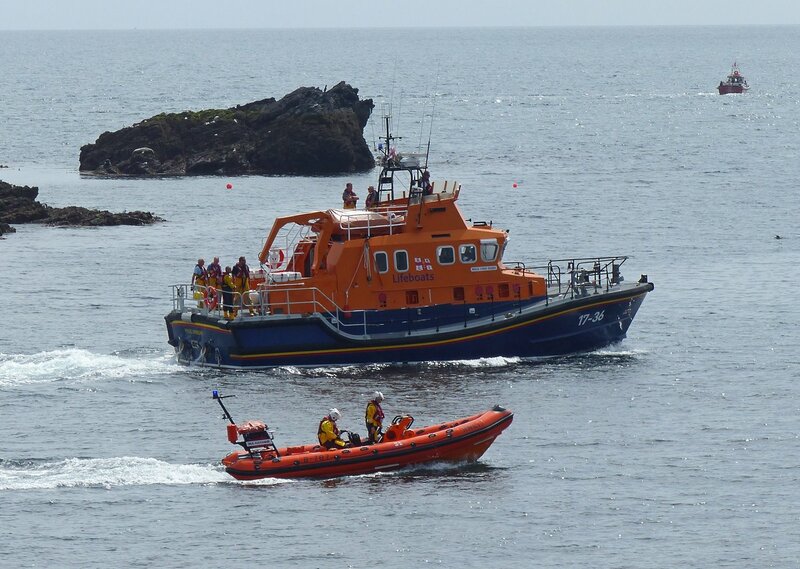 The Lizard lifeboat was launched just before 11am on 15/07/2015 to go to the aid of the French trawler 'Cezembre', 34 miles SSW of the Lizard that has fouled propeller. 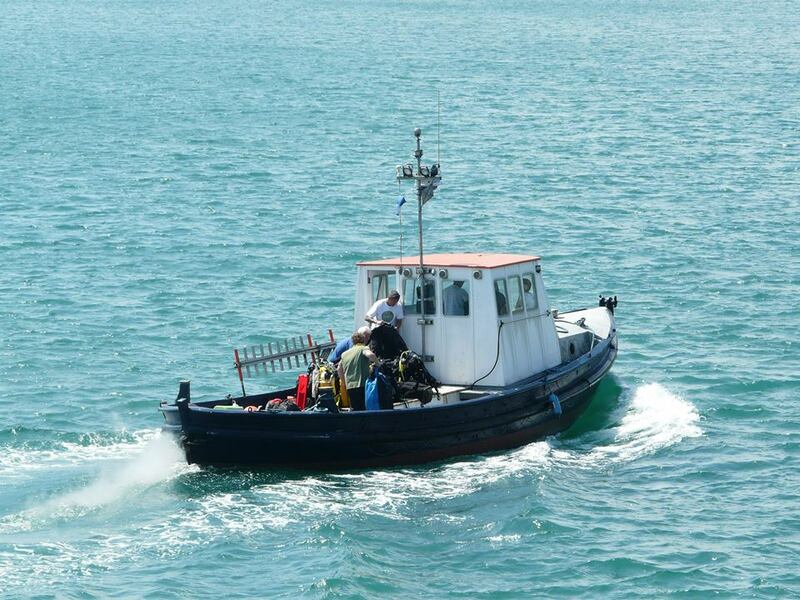 Following a long tow, they transferred the tow to Penlee about 8 miles from Newlyn. Lizard returned to station and Penlee towed the trawler back to Newlyn. A great job by our colleagues at the Lizard RNLI lifeboat station and the MFV Danmark who acted as a brake coming through the gaps. A classic 'Team effort'. 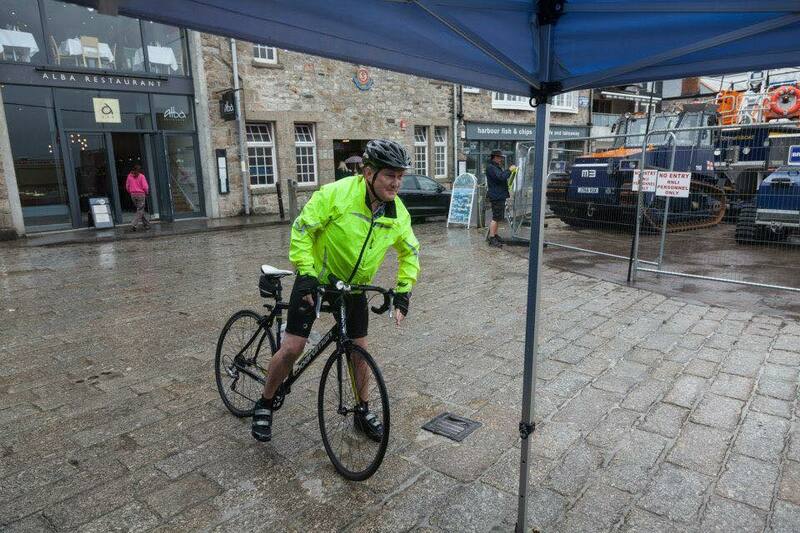 The St.Ives Sportive event took place on the morning of Sunday 12th July 2015. The weather was rather damp and quite windy. This year the sponsorship went to the Penlee appeal. We're still waiting to find out how much in total it raised, but we are aware that the Penlee crew who rode, raised over £1000 between them. 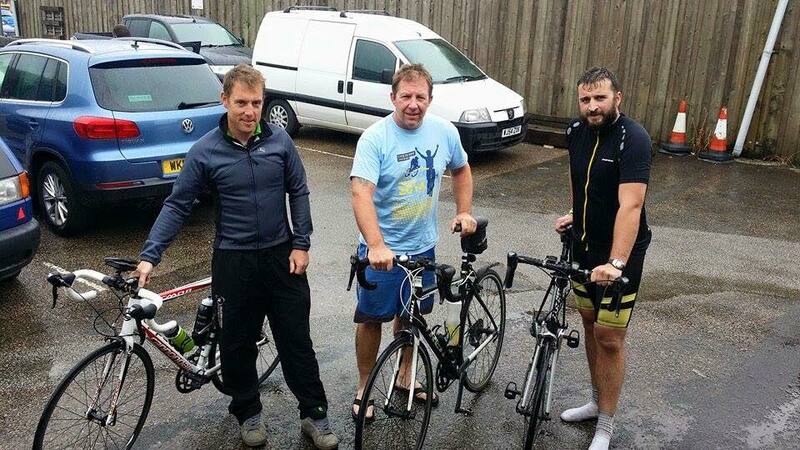 Pictured are Ben, Patch and Paul and below Tony arriving first at St.Ives (But I am told he had a head start!). On Wed 8th July 2015, Penlee lifeboat crew welcomed Richard Uren, from Paddlecrest Coaching, and a great group of sea kayaker's to Penlee Lifeboat Station. Together they raised £1,061 towards our appeal - another fantastic fundraising effort. You may recall we asked you to 'vote for Penlee' a few weeks back. Now your help has paid off. On 8th July our Press Officer (Elaine Trethowan) and Crew member (Marcel Le Bretton) travelled to Birmingham to attend the award Ceremony. 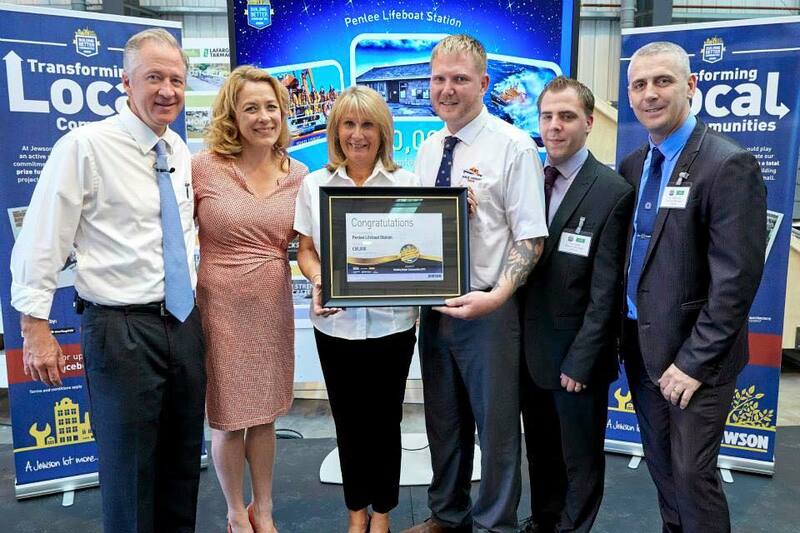 Thank you all who went along to the YBS Agency in Penzance and voted for Penlee Lifeboat. The result was very tight and only a handful of votes separated all three charities – naturally enough, people found it hard to choose between 3 charities that do so much good in Cornwall. 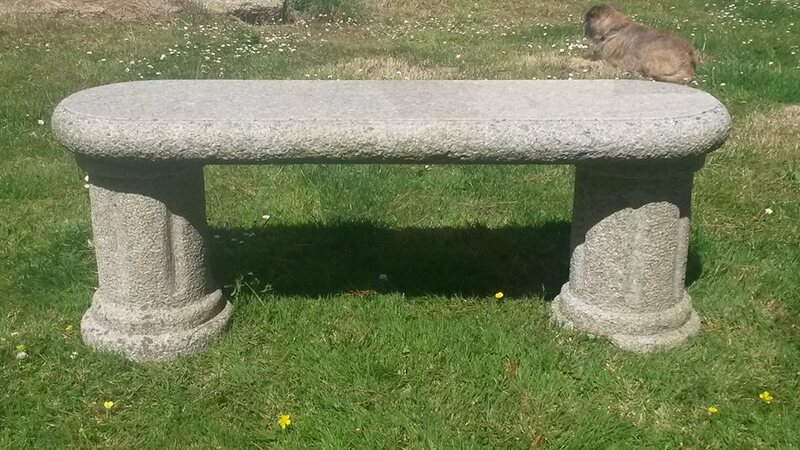 So, how did Penlee do? After all the votes had been counted Penlee RNLI came second and this means that we will receive £300 from the Yorkshire Building Society Charitable Foundation. The Charitable Foundation will be holding a joint presentation to all three charities in the YBS Agency in Penzance sometime towards the end of July. Despite a damp start to the day, there was an exceptional turn out of supporters and helpers.Lots of Stalls and also entertainment provided by 'The Barbed Choir', 'The Chywoones' and 'The Golowan Band'. 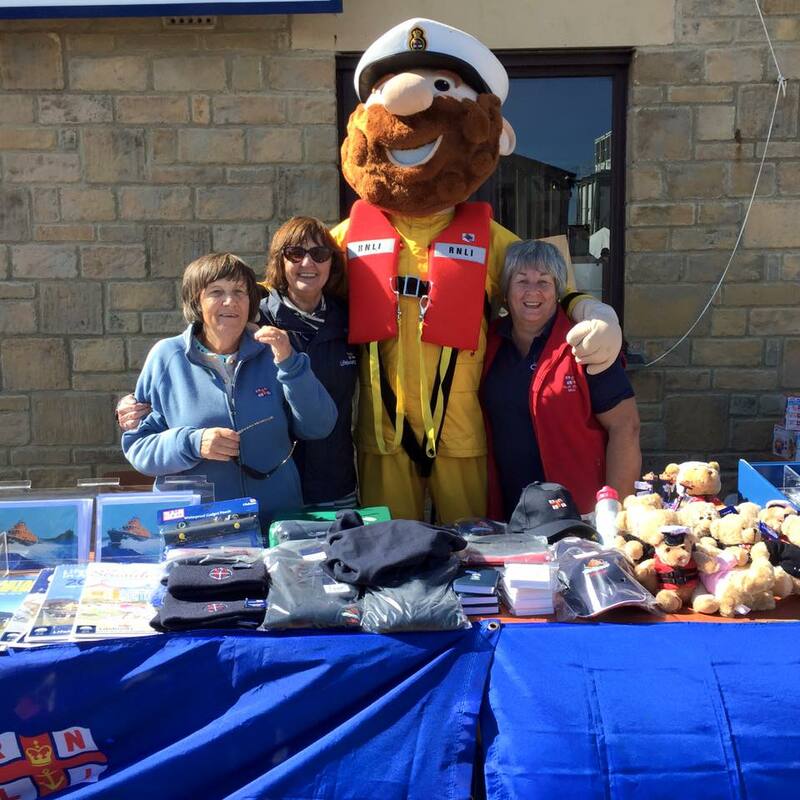 The RNLI's very own Stormy Stan who made a special journey to be with us and handed out lots of goodies to the children. He also enjoyed his cream tea! Over £1300 was raised towards our station appeal. It was a fantastic afternoon raising an amazing amount of money for three local charities. We are still counting the money but we have probably raised over £2,000! Thank you so much for your support & generosity. 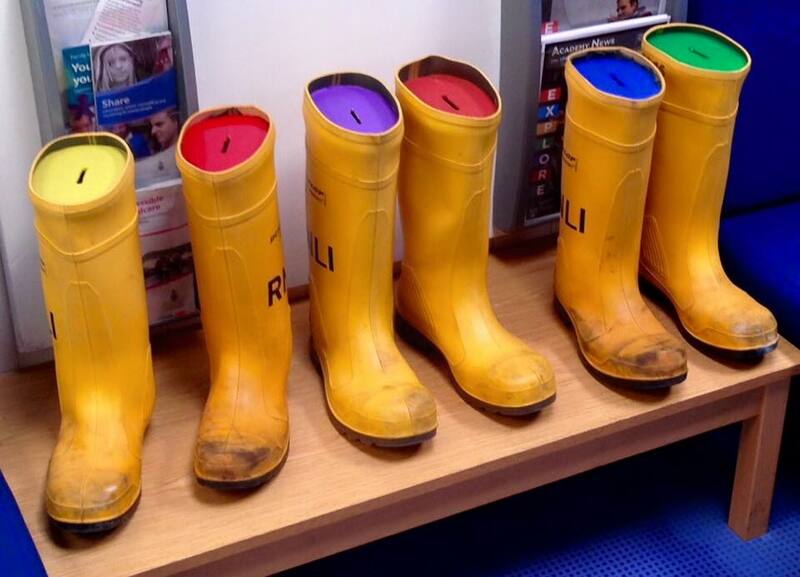 Mounts Bay Academy had the brilliant idea of converting some of our crews wellies into '‪YellowWelly'‬ collecting 'boots' They then went on an collected within the Academy and raised a magnificent £855 for our appeal! 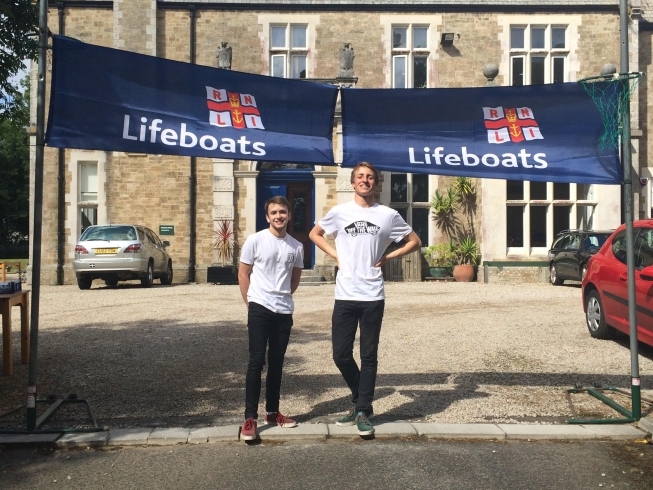 Crew member Tom Matson and Lifeboat Visits Officer Martin Brockman attended a charity afternoon at the Newquay Masonic Hall. The members of the Cornish Acaica Lodge presented them with a wonderful cheque for £1000 Also the Provincial Grand Master for Cornwall presented a cheque from the Cornwall Masonic Benevolent Fund for another £300. A superb night was had at the Mill, Penzance on Sat 9th May. 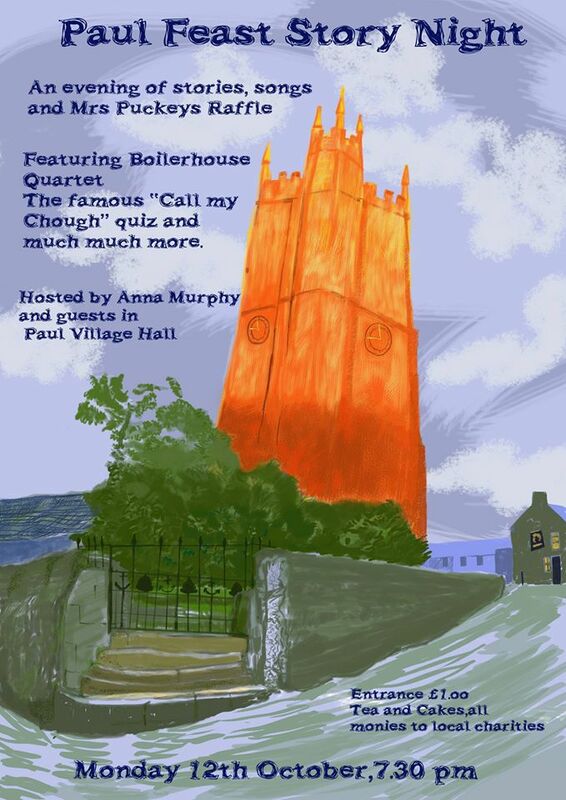 Music from some of the finest folk groups in the country, singing from some of the finest shanty groups, raffles, auction and a selection of Penlee heritage films being shown. Now it's our turn to say a 'Big Thank You'! We raised a whopping £2,979.04! Our grateful thanks go to Robin & Rebecca from The Mill for hosting the event, to Rob & Sue from Sounds Eclectic, to Security Guard Nigel Allen who gave his time freely, to all the amazing musicians who entertained us throughout the night, and to all those who supported the event with raffle and auction prizes. Finally our heartfelt thanks go out to the wonderful crowd of people who attended the Big Thank You - your generosity is astounding! 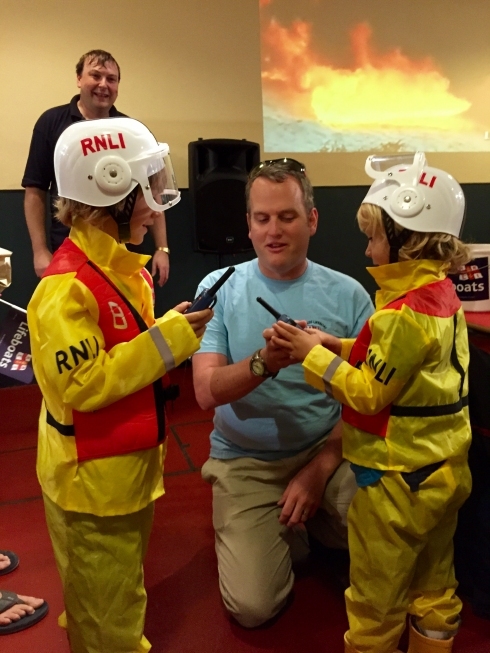 A great way to mark the RNLI Mayday campaign and to raise money for our appeal. Many thanks to all who contributed and also to Carol, Eric, Janet & Dennis for collecting. More amazing fundraisers supporting our appeal, Penwith MTB held an off road charity ride to raise money for our Station appeal. 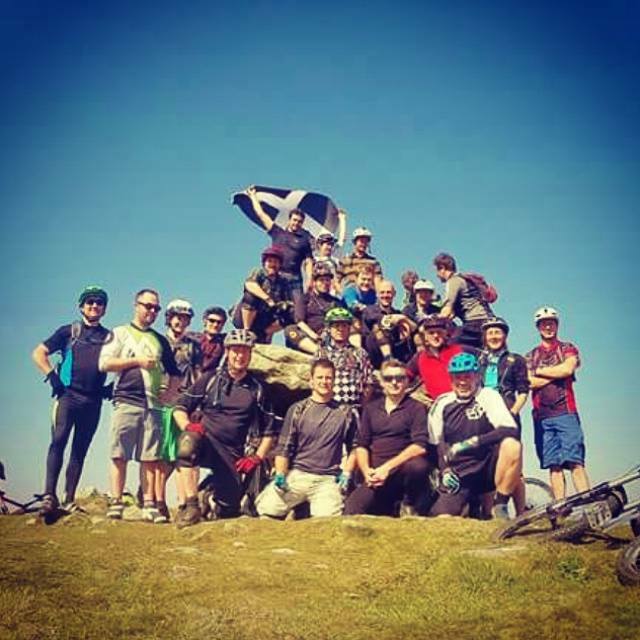 Over 20 Mountain Bikers rode, raising a massive £275. 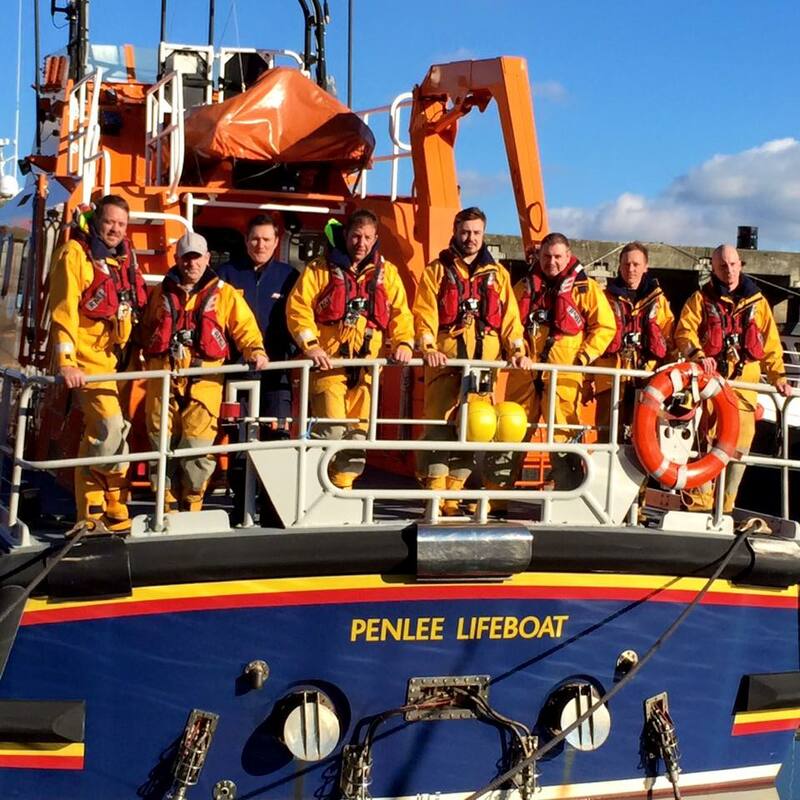 Their Facebook post to Penlee lifeboat reads: Hi all! Penwith MTB held an off road charity ride around the Cornish peninsula today to raise money for the RNLI. 20+ riders raised £275 and a great day was had by all with beautiful weather and scenery. Keep up the great work that you do around our coast! Cheers from all at Penwith mountain biking club! 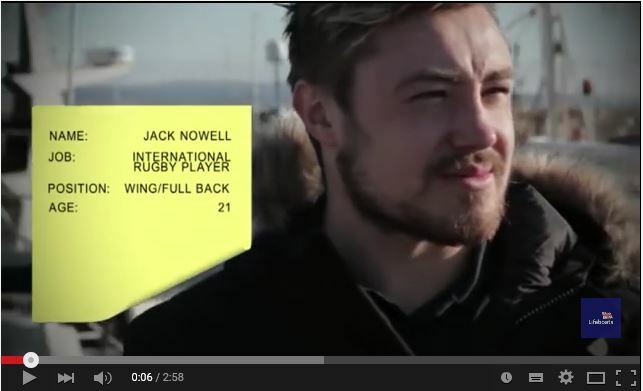 England and Exeter Chiefs rugby player Jack Nowell is urging people to get behind and support Penlee RNLI’s fundraising appeal. The appeal, which was launched today at the Annual General Meeting (Tuesday 27 January), aims to raise £200,000 towards the cost of building a new lifeboat station. Penlee’s current lifeboat station was built in 1983, but unfortunately, now 32 years on, the station is no longer fit for purpose. With around 25 volunteer crew and additional shore crew as well as fundraisers using the building, there is an urgent need for more space. Subject to planning, the much needed new station will be rebuilt on the site of the existing boathouse in Newlyn Harbour. Hoped to be twice as long as the current station, the two story building would provide much improved facilities for the crew including; a larger crew changing and shower room, a dedicated mechanics workshop and a visitor attraction where Penlee’s proud heritage and sea safety information can be displayed, on the ground floor. The first floor will include a galley area and larger crew room where they can rest and get warm after a shout, a dedicated office and a separate training room. The training room will also be available for use by groups in the local community working and training in the maritime area such as the Maritime Coastguard Agency and Sea Scout groups. 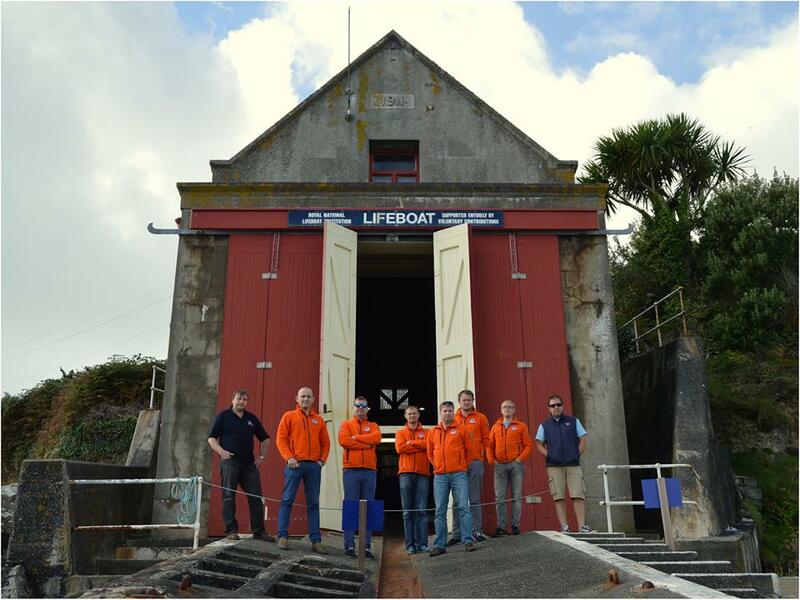 Building works on the new lifeboat station are expected to begin in October 2015, subject to planning permission, and will take five months to complete. 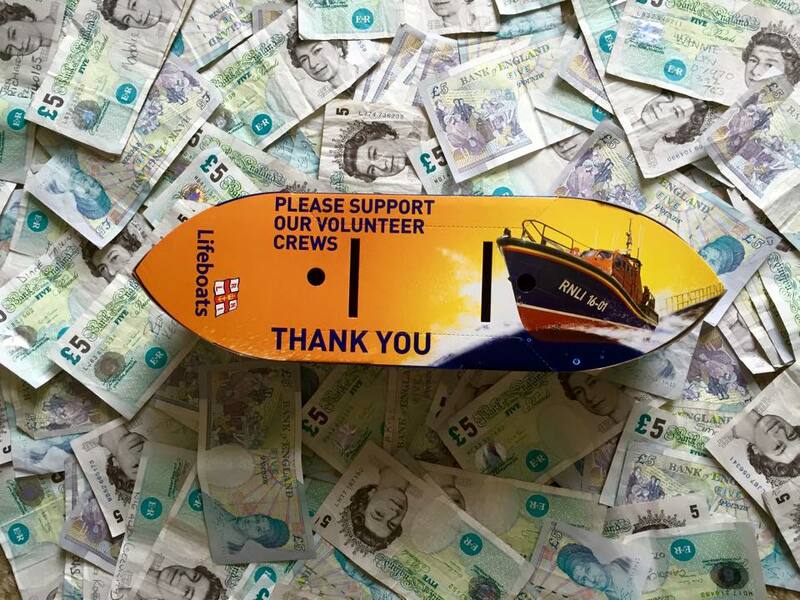 While the majority of the estimated £850,000 cost will be raised through the RNLI’s Key Investment Team which includes trusts, grants, philanthropy and corporate, local fundraisers have launched a public appeal to raise £200,000 towards the cost. 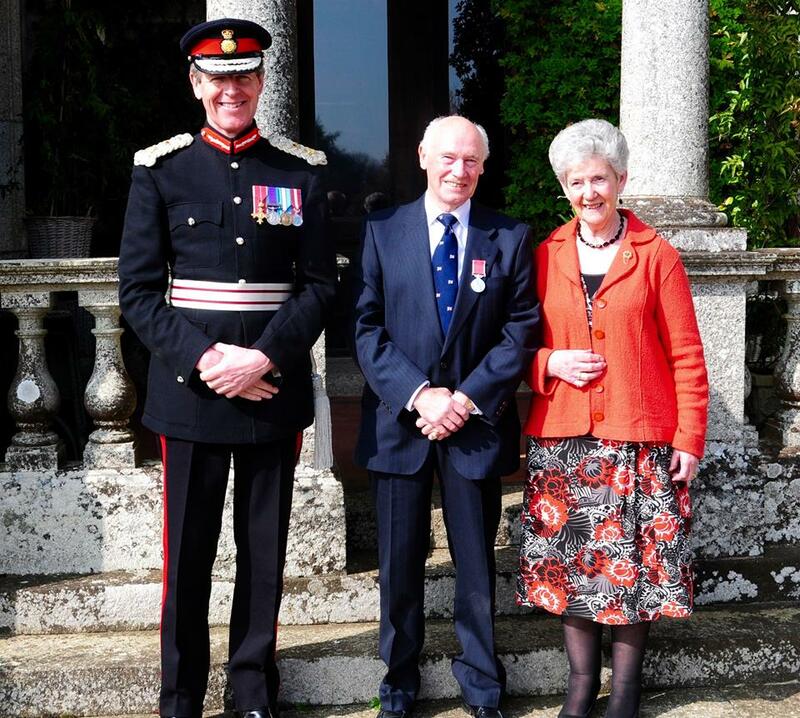 A man from Mousehole credited for his compassionate and selfless commitment to the lifeboat station and wider community has been recognised with a British Empire Medal (BEM) in the Queen’s 2015 New Year Honours list. Roy Pascoe, 75, has been a volunteer with the Royal National Lifeboat Institution (RNLI) in Penlee for the last 34 years, first as a crew member, then Deputy Launching Authority, and more recently as Lifeboat Boathouse Manager, providing an invaluable sense of stability through some difficult times. 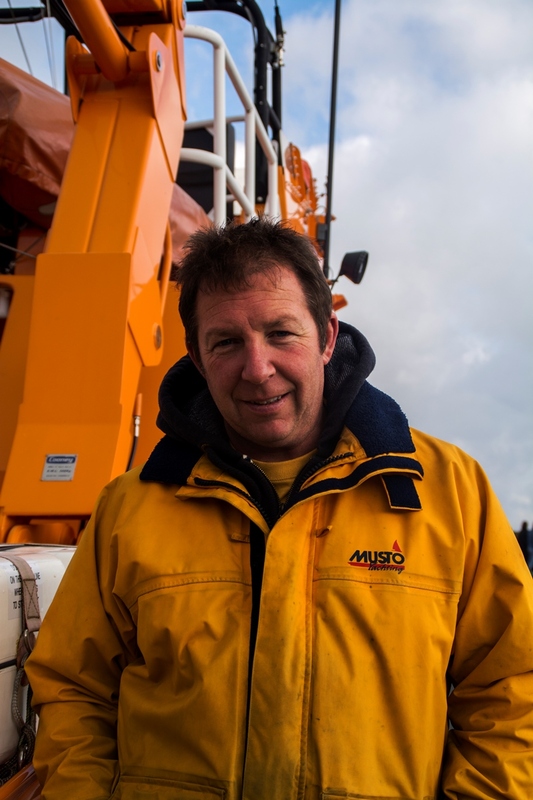 He will now receive a British Empire Medal (BEM) in recognition of his unwavering commitment to the lifeboat crew and wider community of Newlyn. More recently he has set about preserving the old lifeboat station at Penlee Point, together with the small memorial garden which first opened in 1985 to commemorate those lost on the Solomon Browne. 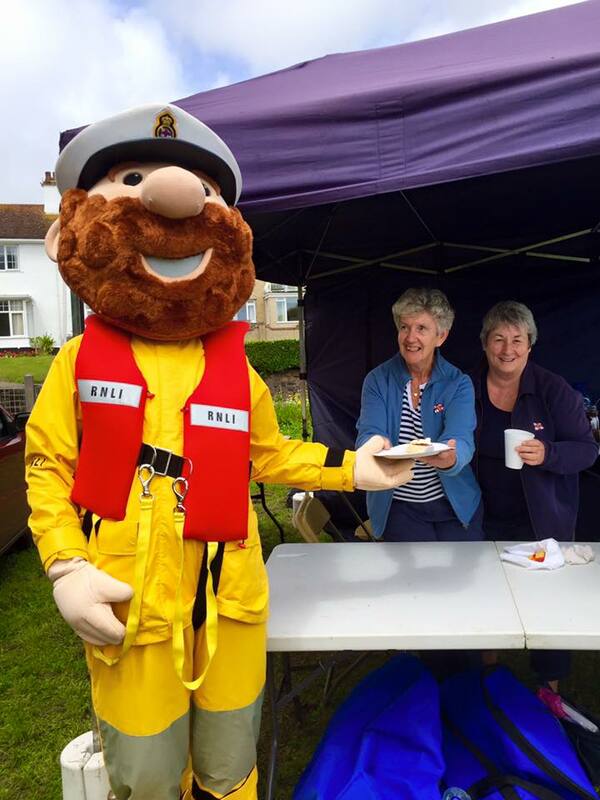 Paul Boissier, the RNLI’s Chief Executive, says: ‘Roy is always cheerful and has a kind word for every visitor. You’ll often find him bringing the crew biscuits and tea after a long night on the water. He never seeks any recognition for his work, instead possessing a quiet unassuming warmth that endears him to all who visit Penlee. 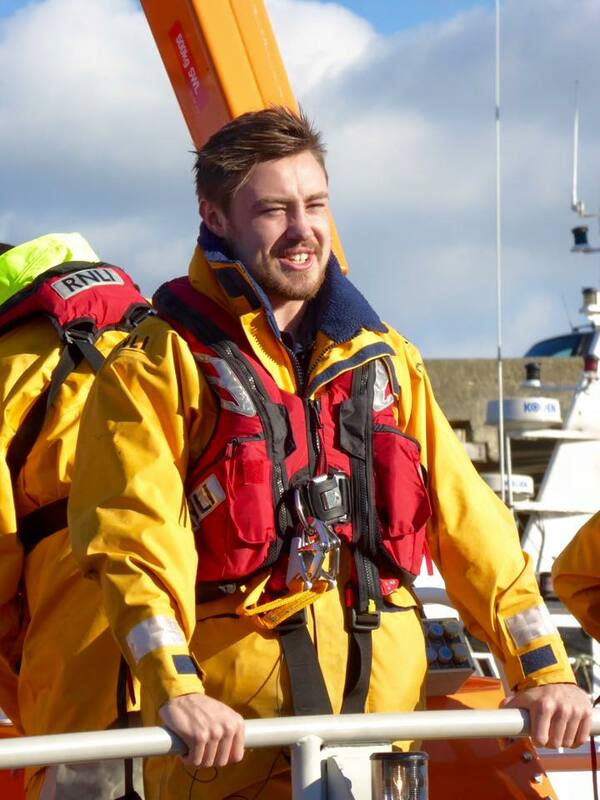 At 8:15pm on 25/11/2015, both lifeboats were requested to launch to assist the Police, a Search & Rescue helicopter from RNAS Culdrose and Coastguard teams from Penzance and St Ives in the search for missing local man, Joe Holtaway. In darkness with lowering temperatures, the Ivan Ellen and the Paul Alexander were very quickly on scene and the crew commenced an extended search of the shoreline and the many rocks surrounding St Michael’s Mount. After a three hour search the lifeboat crew located Joe floating on his paddleboard a mile south of Marazion. Despite wearing a wetsuit, Joe was frozen rigid with the cold and was quickly taken on board the Ivan Ellen. 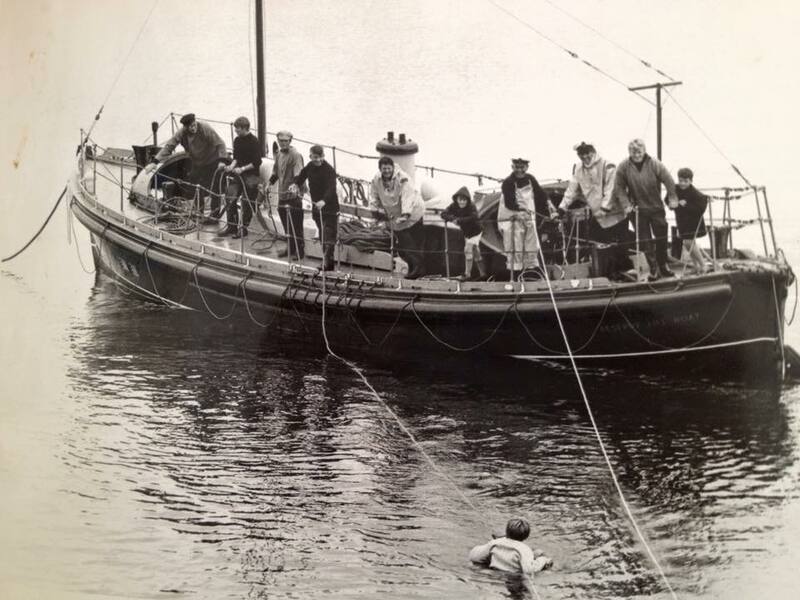 The lifeboat crew rendered immediate first aid, giving oxygen, wrapping the casualty in blankets, and keeping him in conversation whilst the Ivan Ellen sped back to Newlyn. He was then conveyed to Treliske Hospital in Truro by ambulance suffering from hypothermia, and was later released. 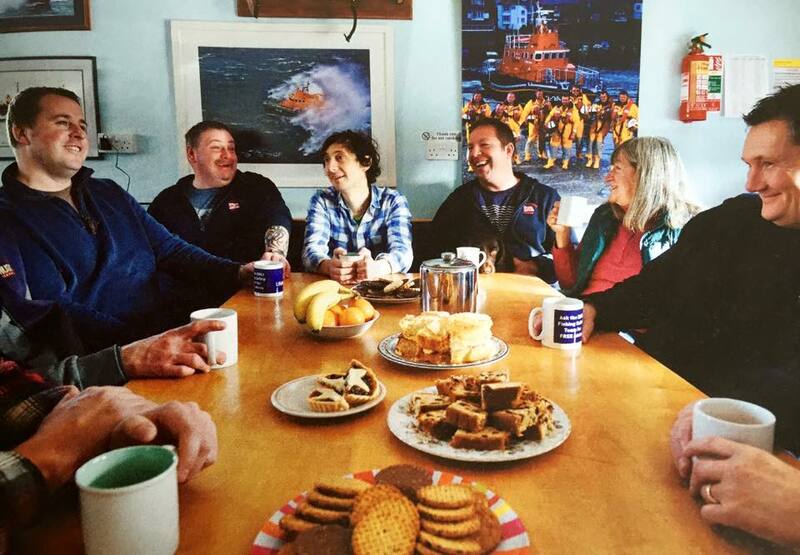 Joe Holtaway and his family later visited Penlee Lifeboat Station and gave their grateful thanks to Coxswain Patch Harvey and the volunteer crew. Janet Madron, Chairman of the Penlee RNLI Ladies Guild, has been awarded a British Empire Medal (BEM) for her enduring service to the Cornish community in the wake of the Penlee lifeboat disaster in 1981, in which Janet’s husband, Stephen sadly lost his life. 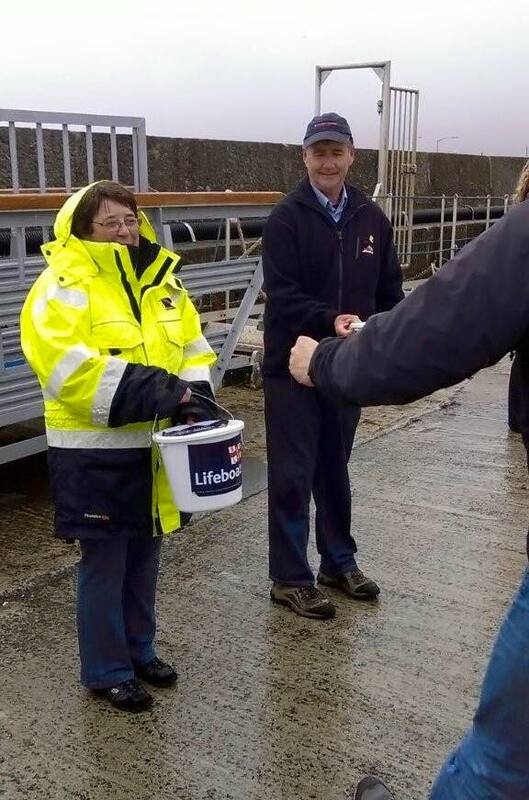 30 years on from the disaster which saw all hands lost on the Solomon Browne when it went to the aid of the stricken coaster Union Star, Janet has been selfless in consistently giving her time to support the crew and the families of the lifeboat station over the intervening years, and helping to raise funds. 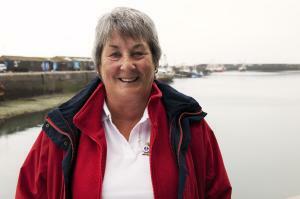 This year (2012) Janet was honoured by the RNLI, receiving a Gold Bar to her Gold Badge at the charity’s Annual General Meeting in London.